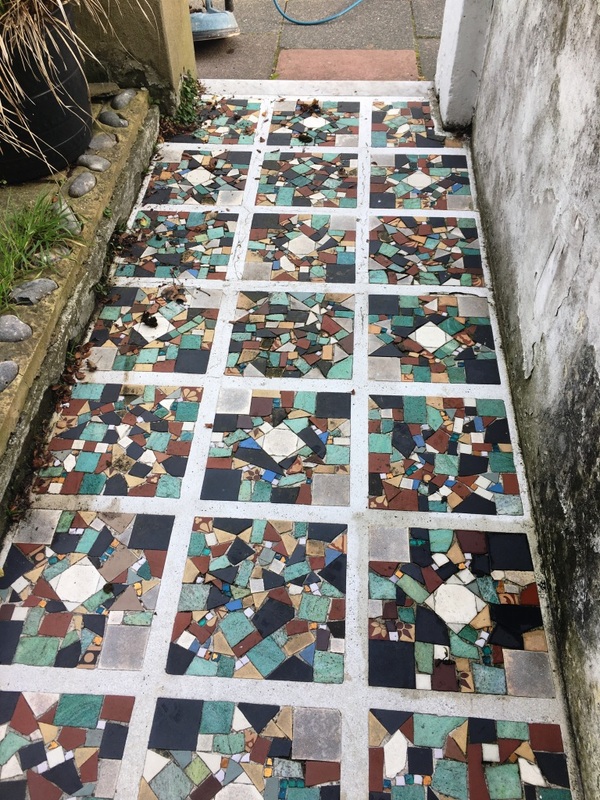 So, I had an enquiry from a very nice lady in Eastbourne who wanted to know if I could use some old tiles she had dug up from her garden. It seems her house was the last one to be built in the street many years ago and the builders threw all the tiles into her garden. 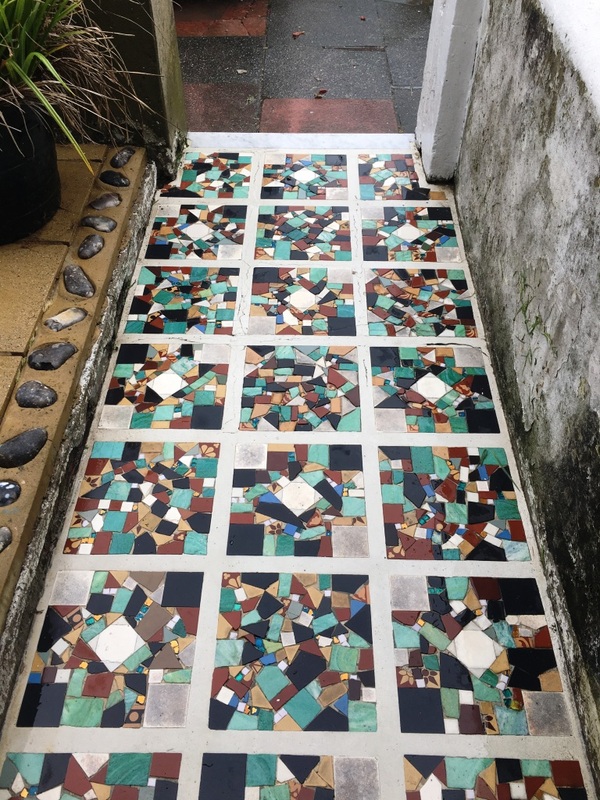 Since then some were recovered to make a mosaic front pathway but there were four buckets of tiles she couldn’t use. I’m based in Eastbourne, so it was no trouble to go around and take a look. I popped round and in my profession you never know when they might come in handy so I bought them off her for £20 which was a bargain really. 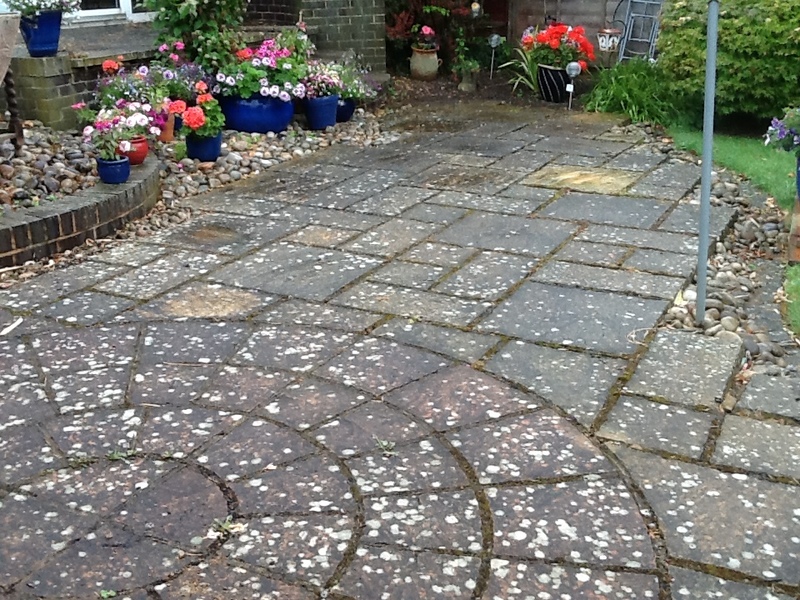 Well I was very grateful to her and after seeing her front pathway and garden I offered to clean the paving and tiles up for free. 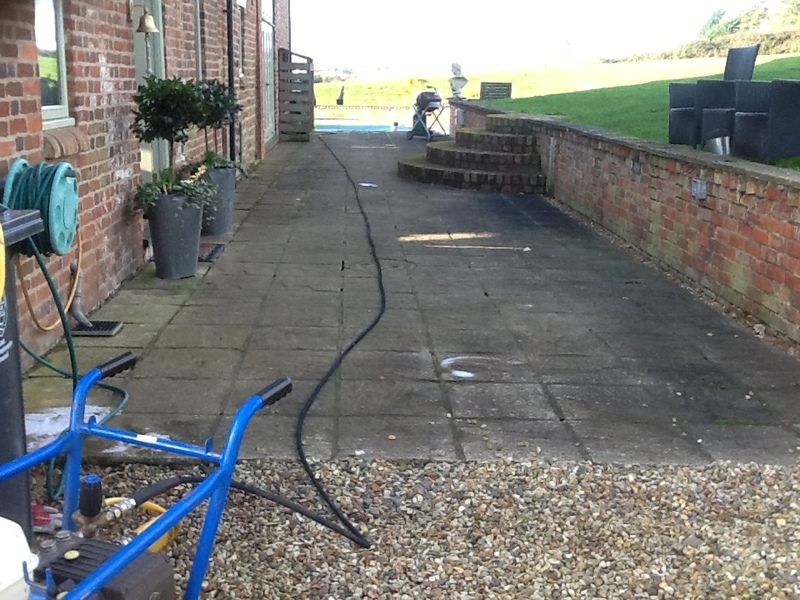 There were two sections of paving that needed cleaning including the mosaic tiles and with my van being parked right in front of the house I was able to reach them with my van mounted high-pressure cleaning system. 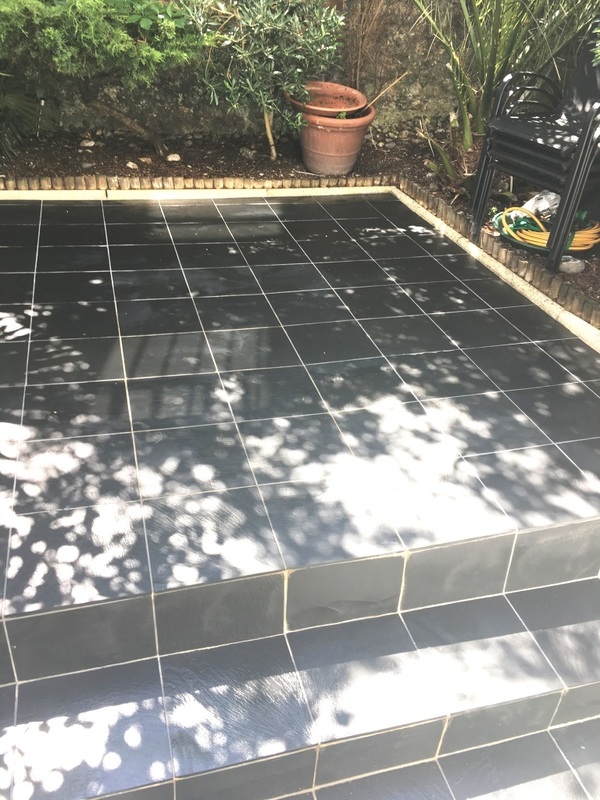 The first job was to use low pressure jet wash to the paving to remove surface dirt and then apply a medium dilution of Tile Doctor Pro-Clean and let it soak into the tile for about ten minutes. The solution was then scrubbed into the tile using a stiff brush to release the ingrained dirt. The last step was to finish the process using our high-powered state of the art truck mount extraction system. These machines are a big investment but well worth the cost in the amount of time they save. They work by applying hot water under pressure to the surface via a special spinner tool whilst simultaneously extracting the soiled water back to a collection tank on the van. 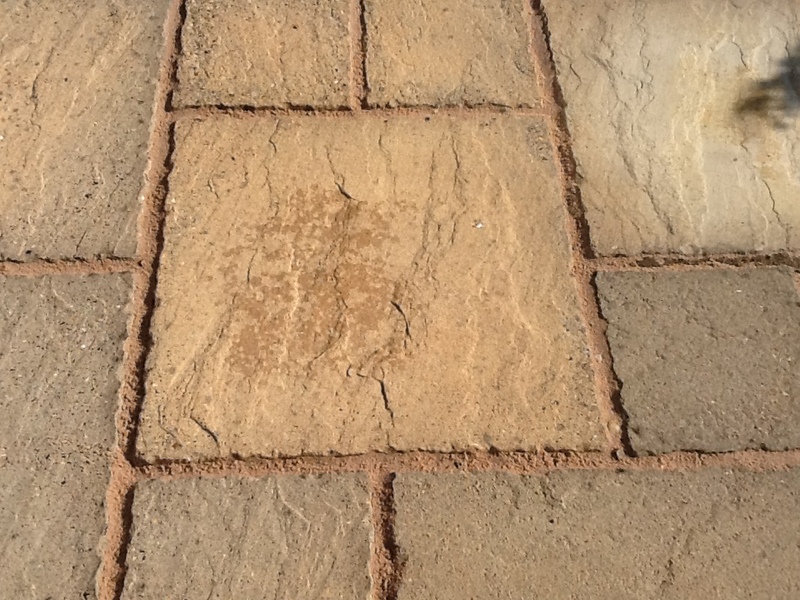 You can set the pressure of the machine and in the case of paving I use a lower pressure to ensure the mortar between the paving isn’t dislodged. 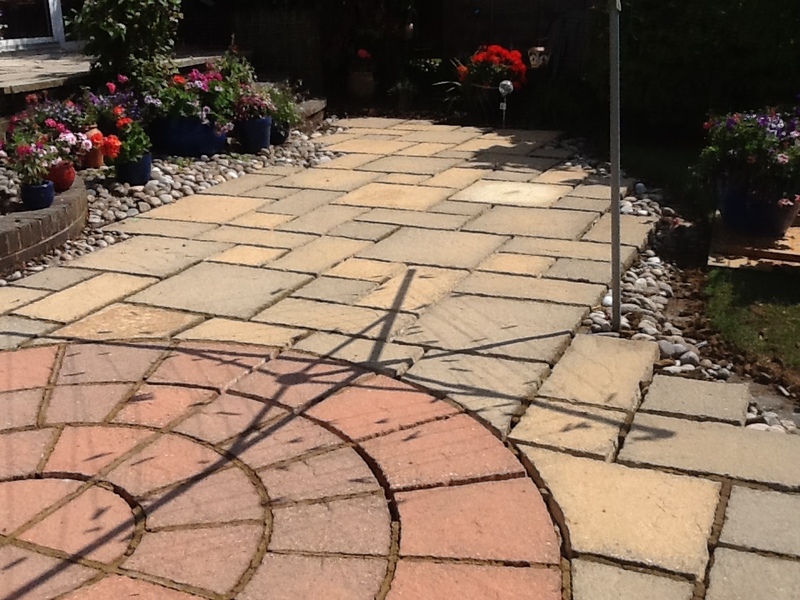 The paving came out remarkably well as you can see from the photographs. Thank you Joy for your enthusiasm in the finished product, for the opportunity to reveal your lovely pathway, for the buckets of tiles you recovered and for the copious amounts of tea you served to me. 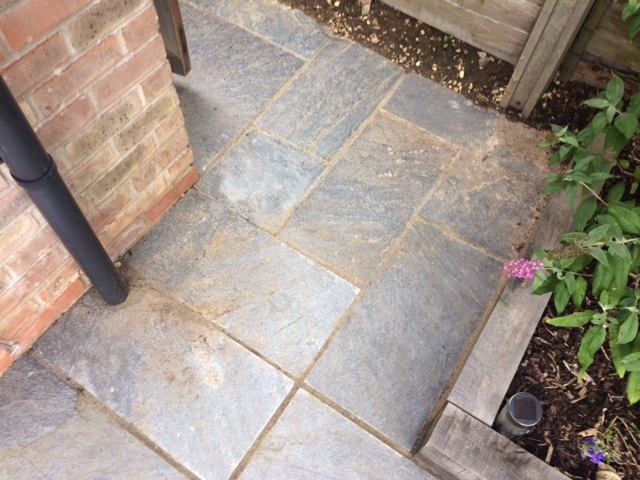 Details below of a job I completed earlier in the summer in the Berkshire town of Thatcham which is just east of Newbury. 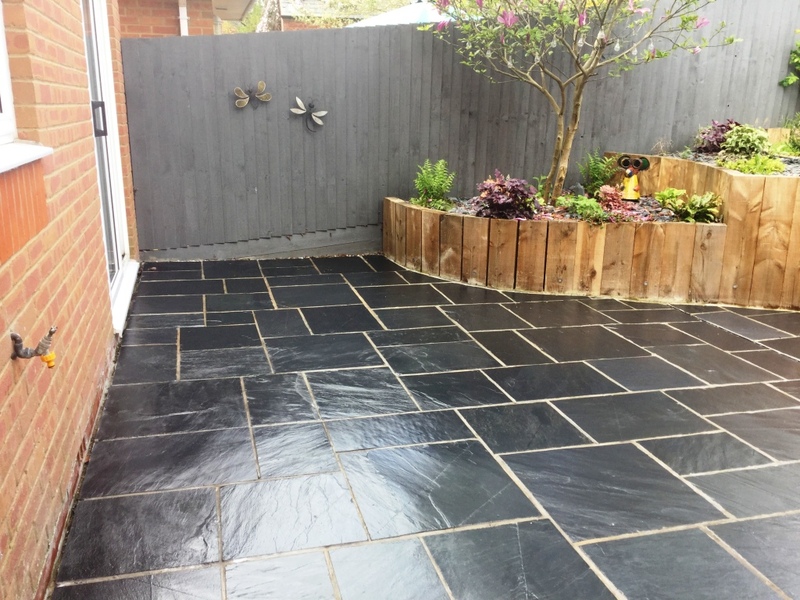 The customer had a lovely Slate Patio installed the year before which had not been sealed by the builder and it had since become dull, light grey and unpleasing to the eye. 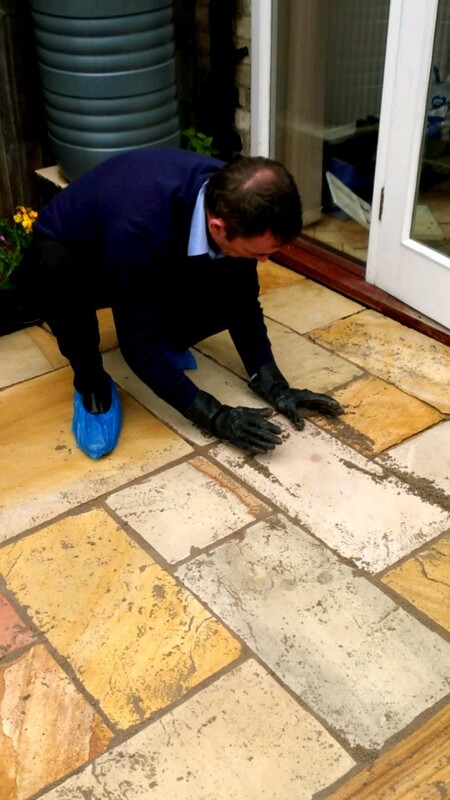 Additionally there was a haze on tiles from sand and cement that had been used to point between the paving which the customer couldn’t remove. I first went round there to take a look at the job and work out a price; we often get asked to quote over the phone but it’s really difficult to do that without look at the job as you never know how things are going to work out unless you do a test clean. 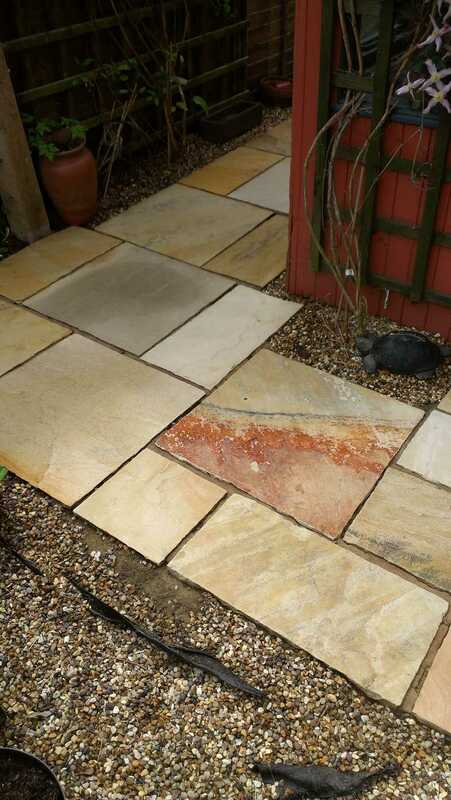 In this case I was able to demonstrate the process to the customer on one of the paving tiles which you can easily pick out in the photographs below. 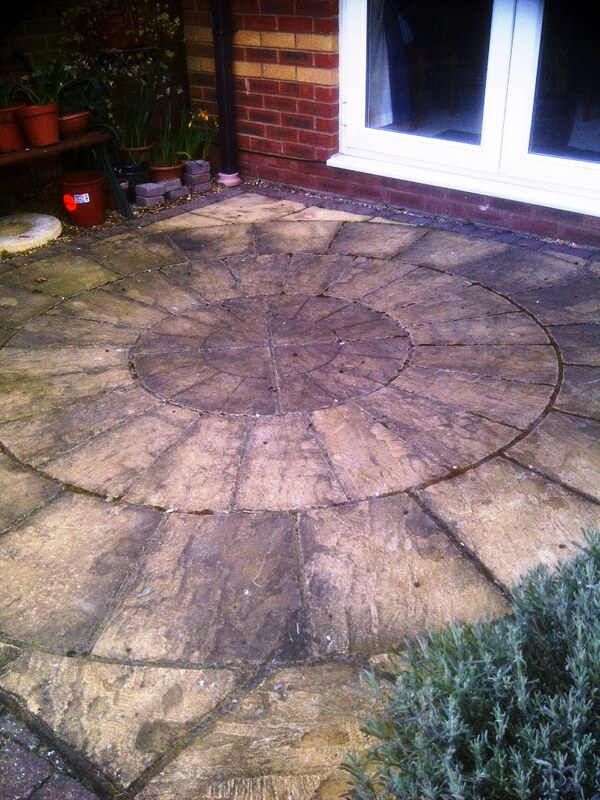 Happy with the demonstration I was given the job to do the whole patio so I arranged to a date to come back and do the work. On my return the first job was to tackle the sand and cement haze that was covering much of the slate patio. Fortunately for me the builder had not sealed the tiles so this was just a straightforward case of applying a solution of Tile Doctor Grout Clean-Up, leaving it to dwell for ten minutes and then scrubbing it into the paving with a mechanical scrubbing machine to release the sandy haze as well as breaking down the soils on the tiles. 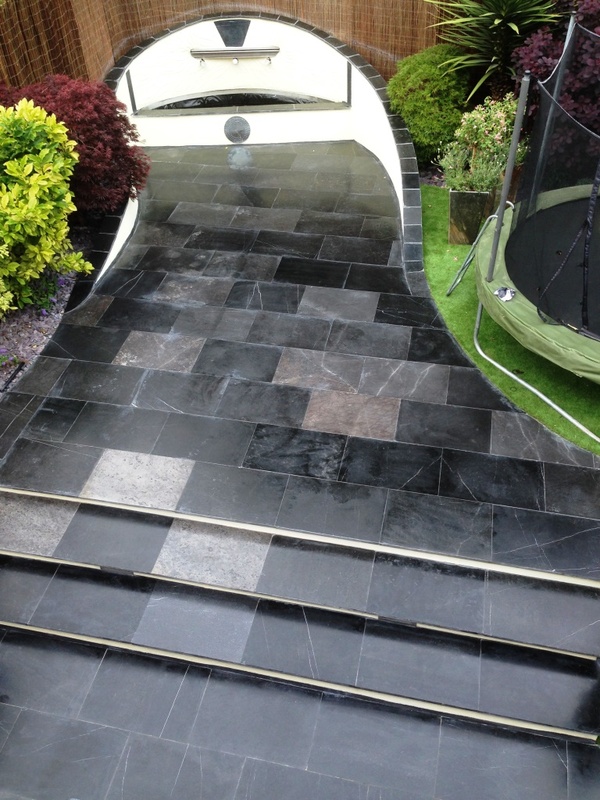 You should be aware that Grout Clean-Up is an acid based product and Slate like most natural stone is acid sensitive so it’s important to remove it as soon as its done its job and rinse down the stone with water soon after. 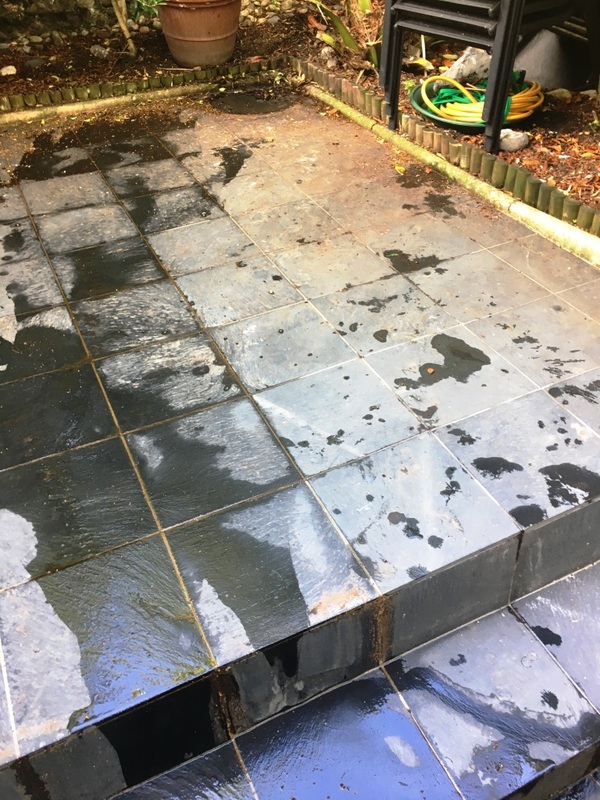 To rinse the slate patio I used our specialist truck mounted systems which gently blasts the soils from the stone with hot pressurised water whilst simultaneously recapturing the waste back into a tank on the van. This action also neutralises the stones which is important before applying sealer. 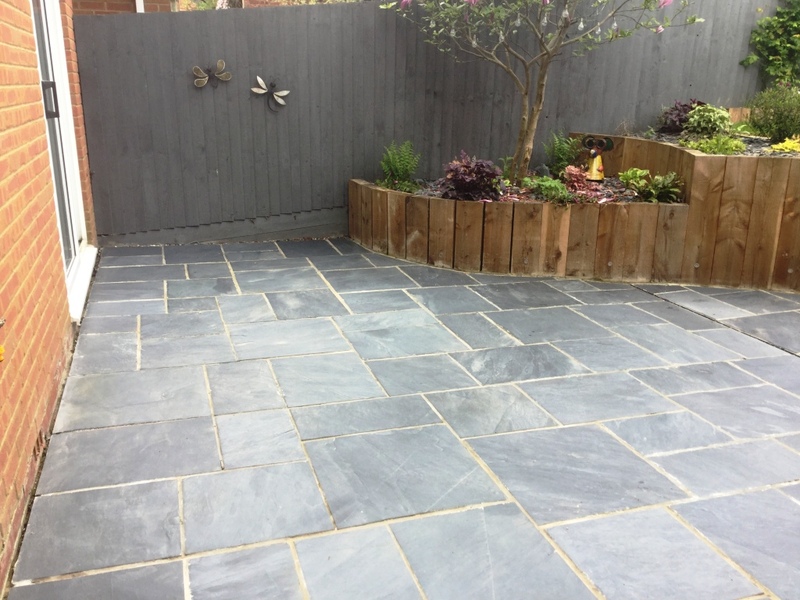 The Slate pavers were then allowed to dry and being a very hot day this only took a couple of hours. 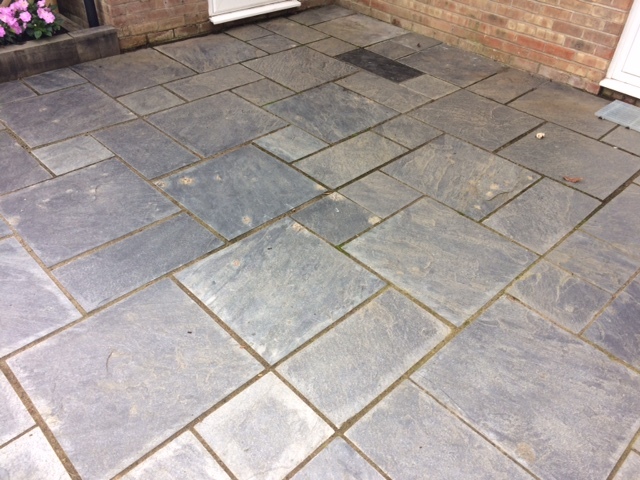 After a long lunch I returned to find the Slate was dry but still looking rather grey so to restore the natural dark colours to the stone I applied a coating of Tile Doctor Stone Oil then after approximately 1 hour any excess stone oil was buffed off the tiles leaving it to fully dry off overnight. The following day I returned to apply two liberal coats of Tile Doctor Ultra Seal which is a solvent based no-sheen, natural-look penetrating sealer that will provide the needed protection from the elements and make it easier to clean in future. My customer was very pleased with the final results and left the following feedback on the Tile Doctor feedback system. 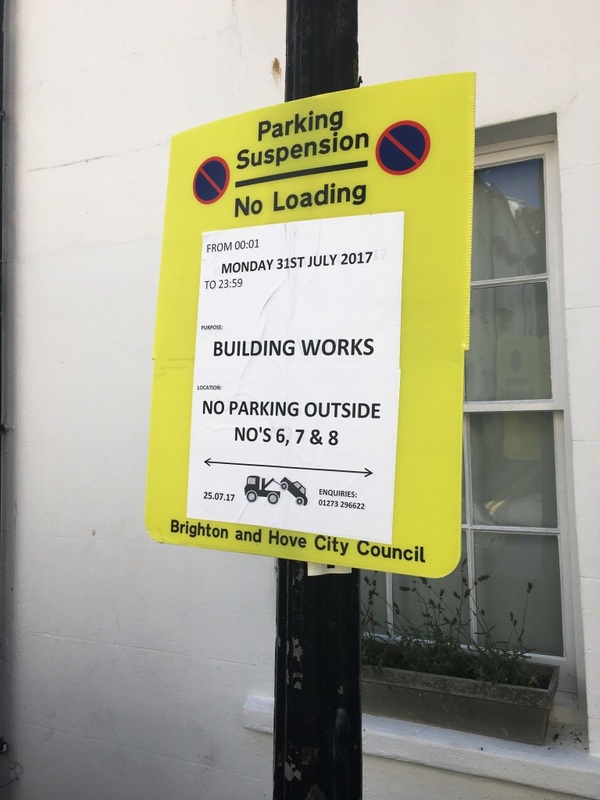 Brighton is a great location to work with a huge variety of property styles and tile installation but being such a popular location parking can be an issue. 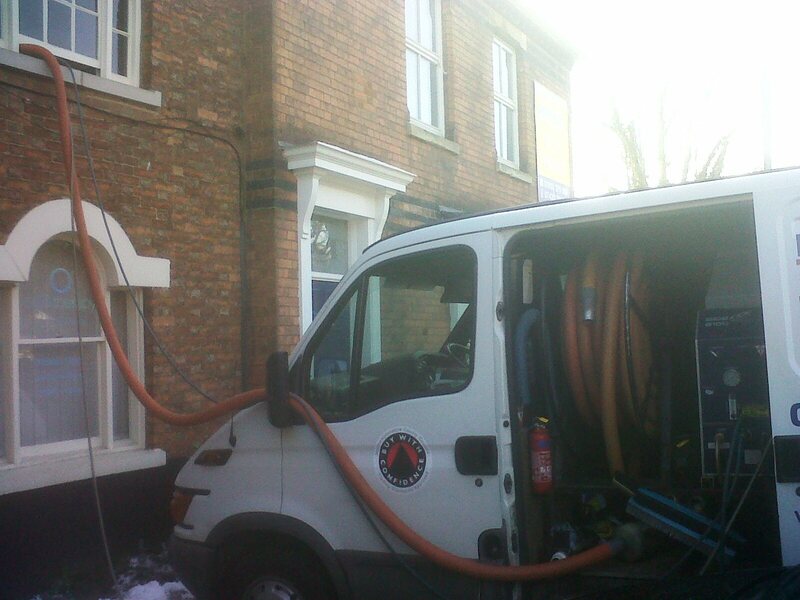 We need to park our van physically close to the property so we can make use of our powerful Truck mounted cleaning system that weighs in at 3/4 of a tonne! It’s a really clever system that uses water under very high pressure to clean the stone whilst at the same time recovering the waste back to a storage tank in the van making it a very clean operation even in the most awkward conditions. 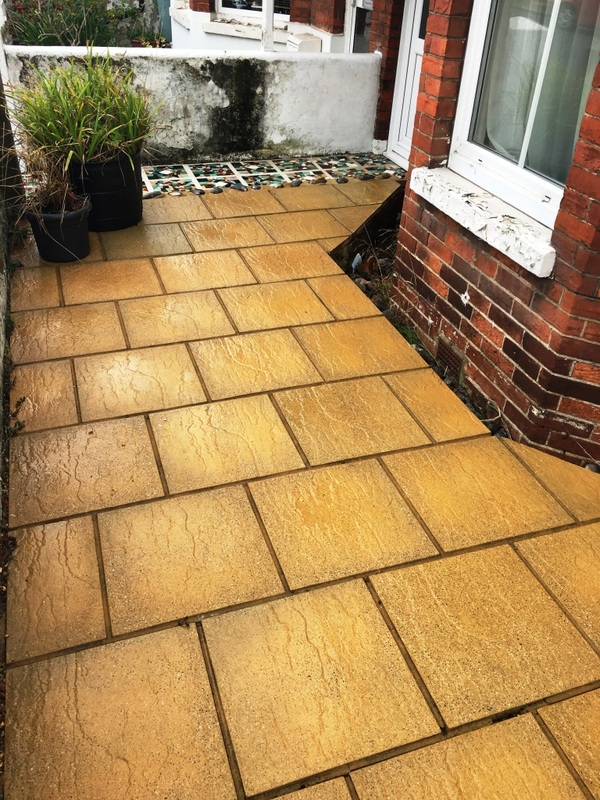 I thought I would mention this first as I was asked to deep clean and seal the lower ground level Slate tiled courtyard patio at this property in Brighton which was located down a small side street where people rarely moved their vehicles due to lack of spaces available. Fortunately I was aware of the issue and managed to overcome it by arranging a parking suspension with Brighton and Hove City Council allowing me to park my van. 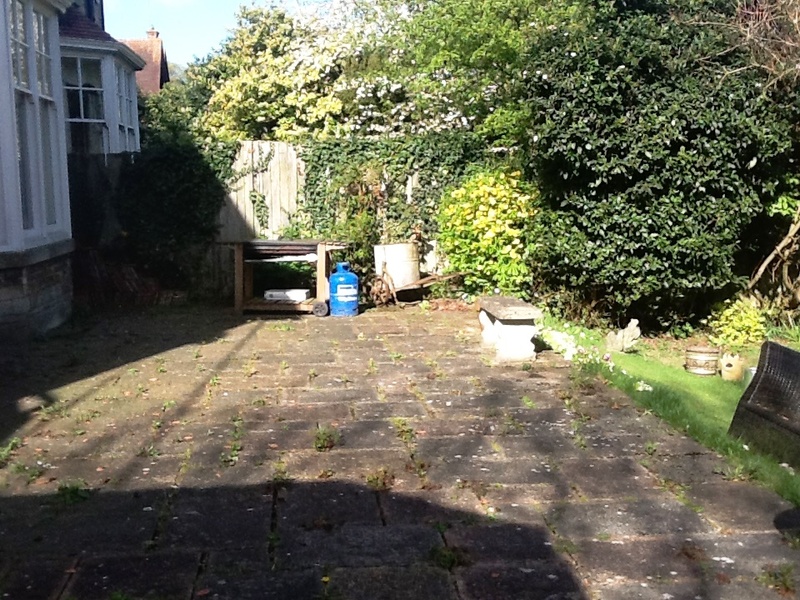 This patio was open to the elements and was also used by the owner’s dog. 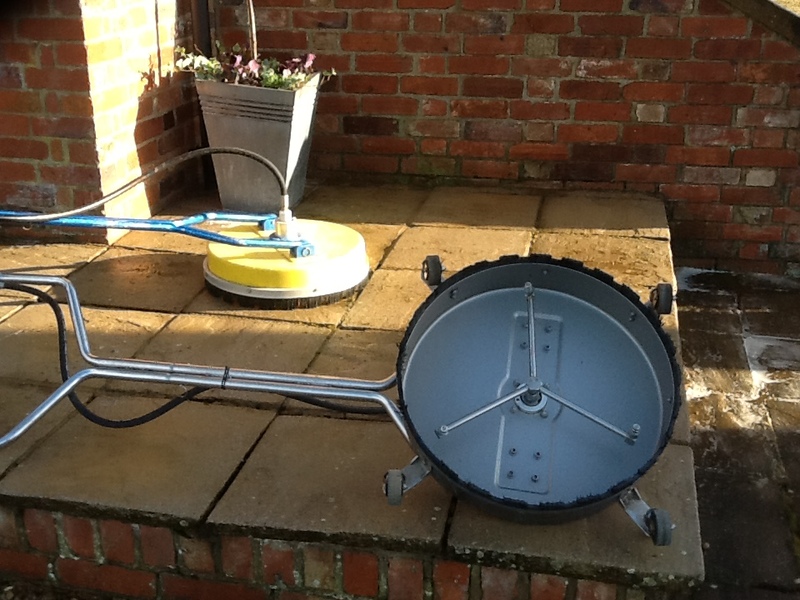 Further due to its inaccessibility it had never been cleaned apart from with the general hosepipe sprayer. 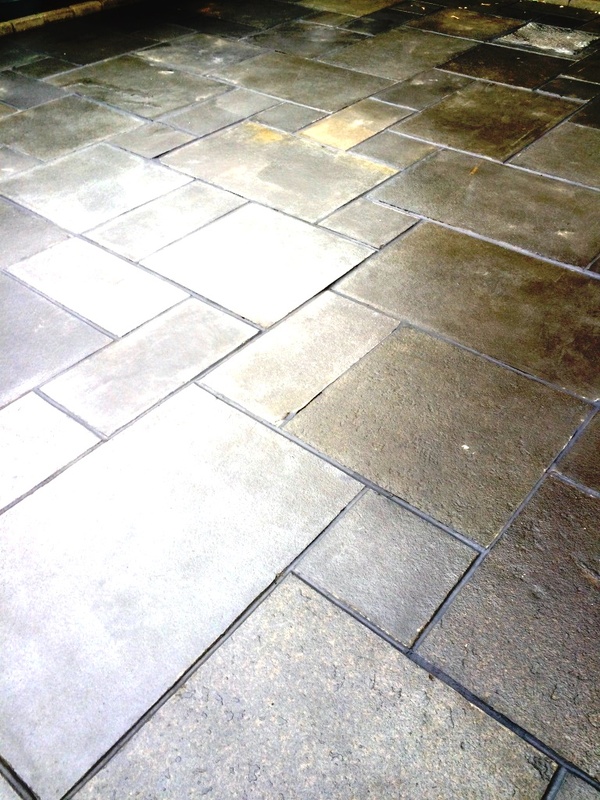 Any kind of porous stone will over time become dirty and stained if the sealer is not maintained, sealers do fail eventually and usually in the highest traffic areas first where they become worn down the most. 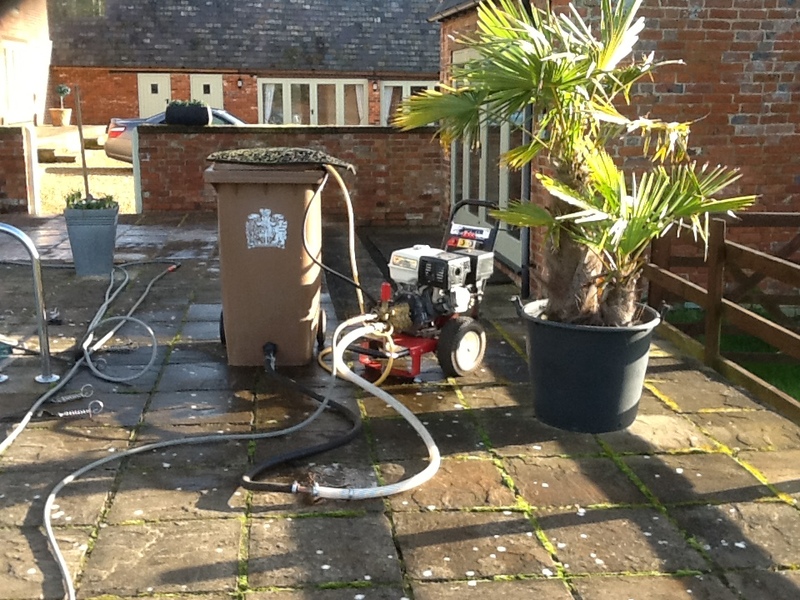 The first job was to pressure clean the entire area using the truck mounted system I mentioned earlier, it works well on patios removing all sorts of detritus that can build up over time. 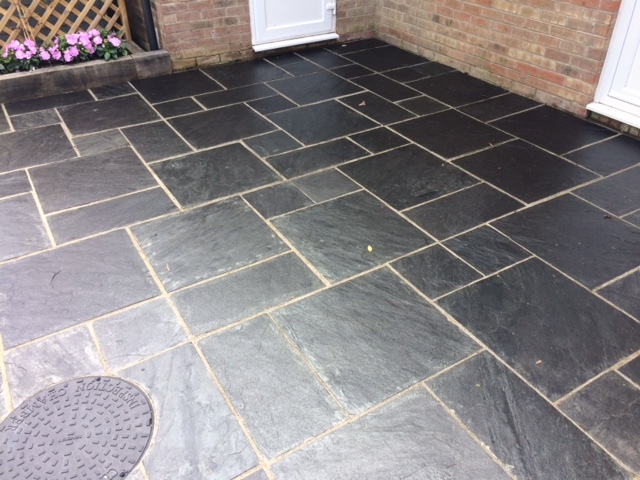 With patio now clear I was able to see the condition of the slate which showed grout smears on the surface from installation as some stubborn staining that the pressure treatment had been unable to shift. 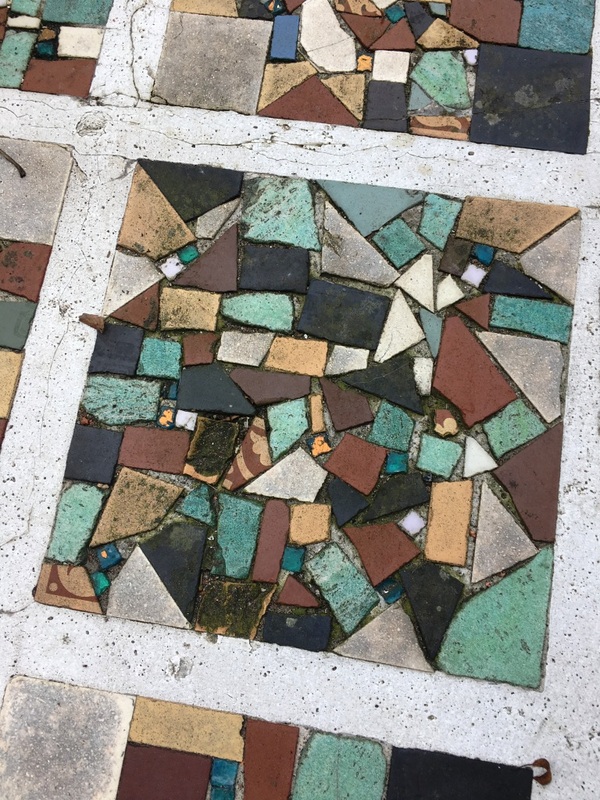 To resolve this I mixed up a batch of Tile Doctor Cleaning Agent Oxy Gel together with Tile Doctor Acid Gel and applied it to all the problem areas. 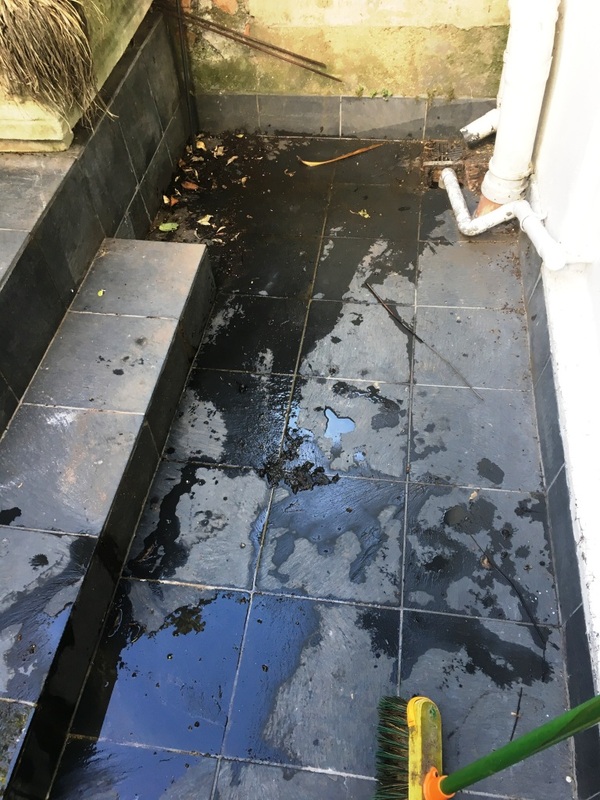 Liquids have a tendency to run (patios have a gentle slope to allow for rain run off) whereas Gel’s remain in place so they dwell on the problem areas longer and really get to work. I left the mixture in place for a short while before scrubbing it in with a stiff brush and then extracted it using truck mount system. The water from the truck mount also neutralised the acid which is important as you shouldn’t leave acid on natural stone for too long. Fortunately there was no rain that night and being August also quite warm so I was pleased to find the Slate had tried off fully by the next day when we returned to seal it. To be certain however I ran some quick damp tests to check that the floor was completely dry and ready to be sealed. 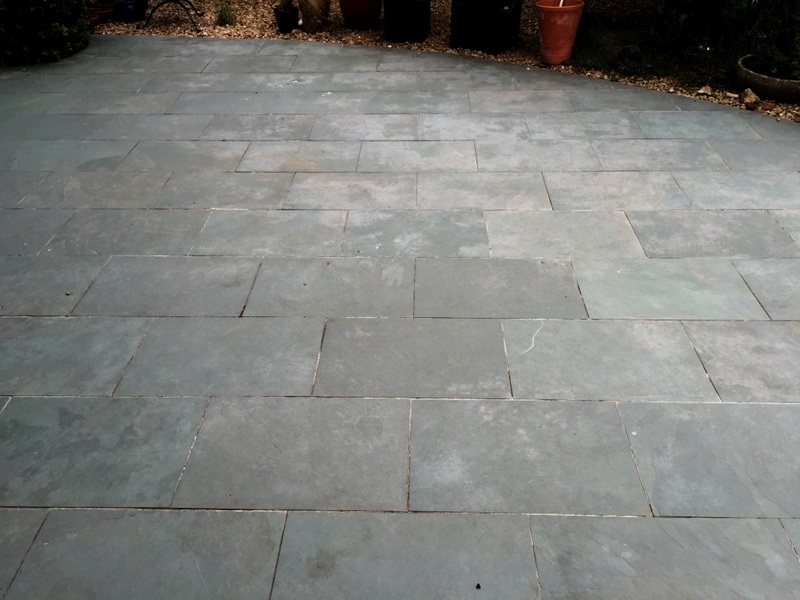 Once satisfied, I applied a couple of coats of Tile Doctor Colour Grow which works really well on Slate giving it that much needed protection against dirt and stains, along with a full lustre finish that enhances the character of the floor. The client was elated both with the result and even more so after we explained how to maintain the look of the tiles with having a doggy in the house! 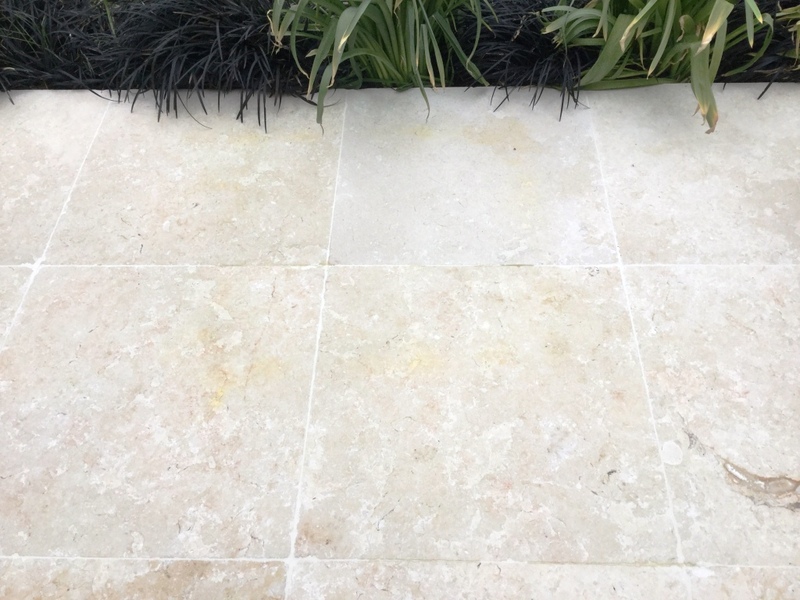 This is the ideal time of year for property owners to not only think about restoring their internal natural stone floor tiles, but also their external tiles. 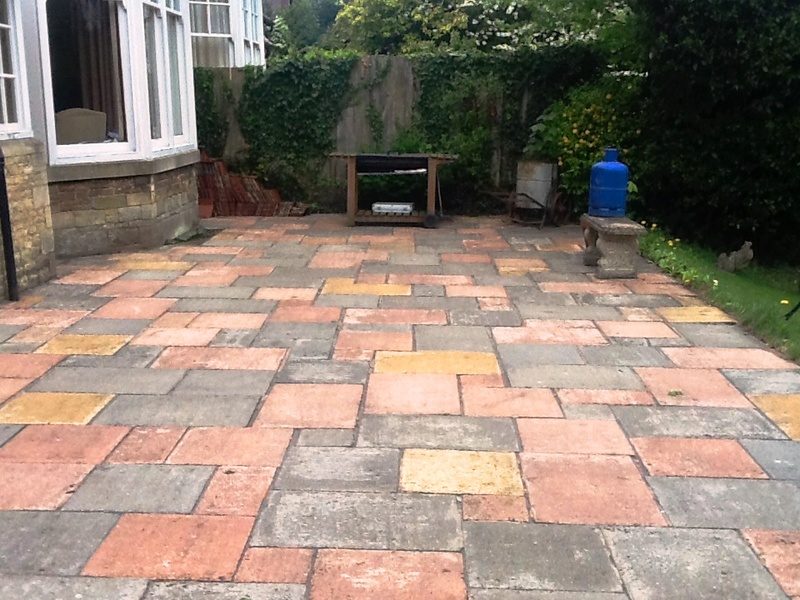 With it being Summer, the weather is warm and dry enough for patio restorations to take place. 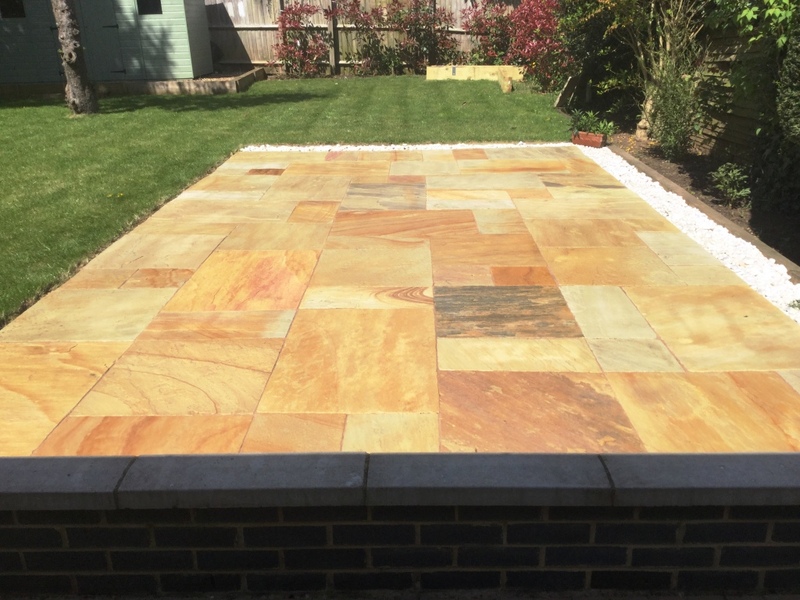 The photographs below show a recent restoration of a two-year old Sandstone tiled patio at a property on a new build development in Bedford, the country town of Bedfordshire. 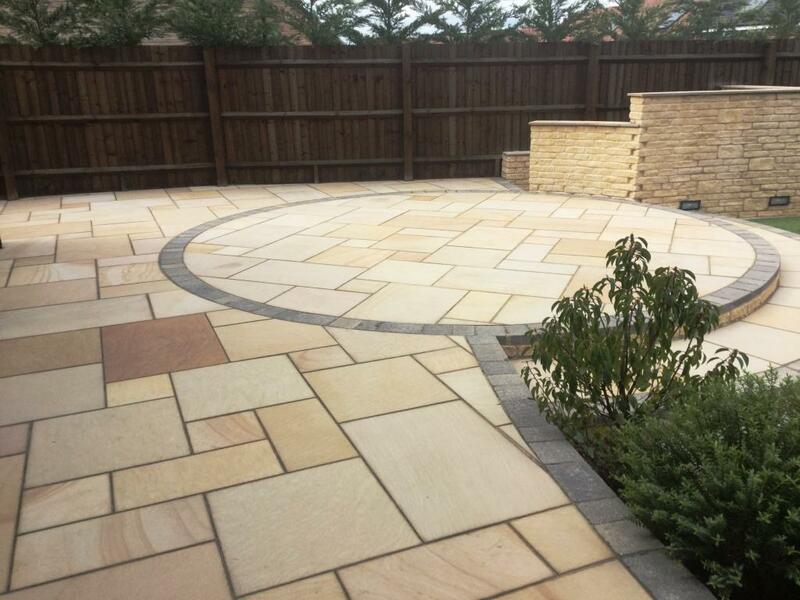 Sandstone is a naturally porous stone, which does make it more vulnerable to the elements when it is used for outside flooring and is not sealed. 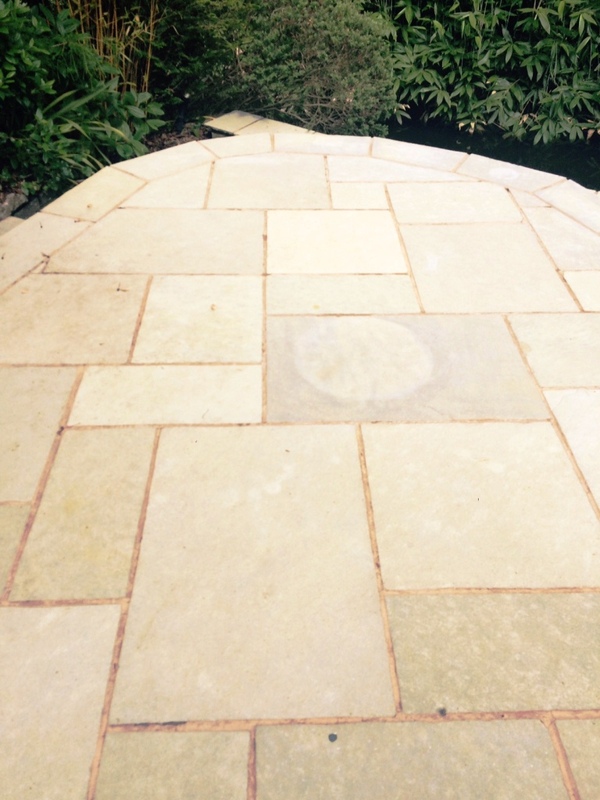 Unfortunately, the patio had not been sealed when it was first installed, and during the two years since, the combination of damp weather, a lack of sunlight in shaded areas, and a build-up of green staining from moss spores – together with general dirt and grime – had greatly spoiled the appearance of the beautiful stone. 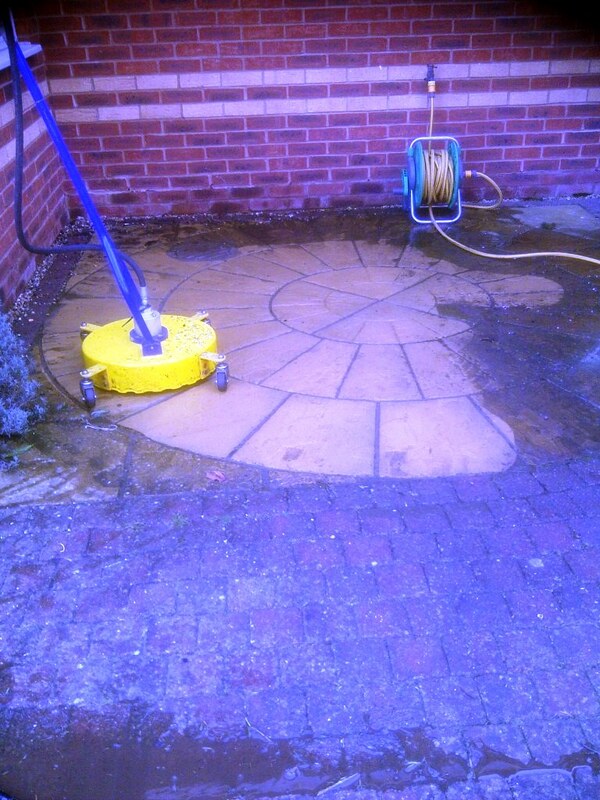 My first course of action in carrying out the restoration was to lightly coat the patio with Tile Doctor Pro Clean. This is a multi-purpose, alkaline-based cleaner which is suitable for use on most natural stone, including Sandstone, Granite, Limestone, Slate, and Travertine. 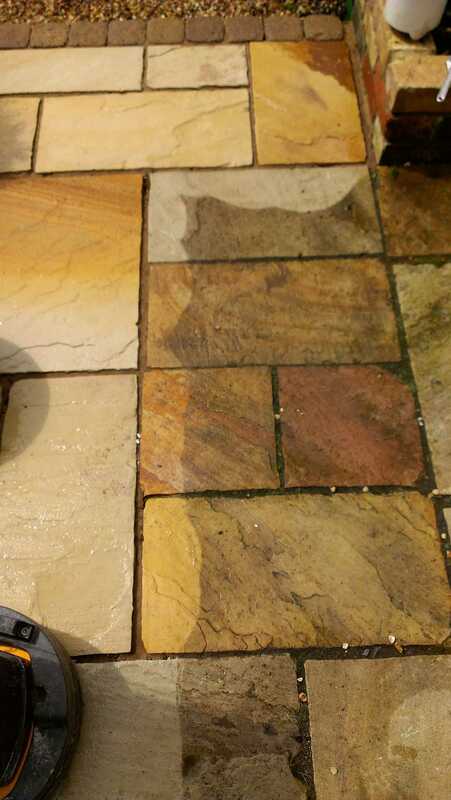 The product was subsequently agitated with a scrubbing brush fitted to a rotary machine, before I pressure washed the patio at a medium pressure to avoid damaging the stone. 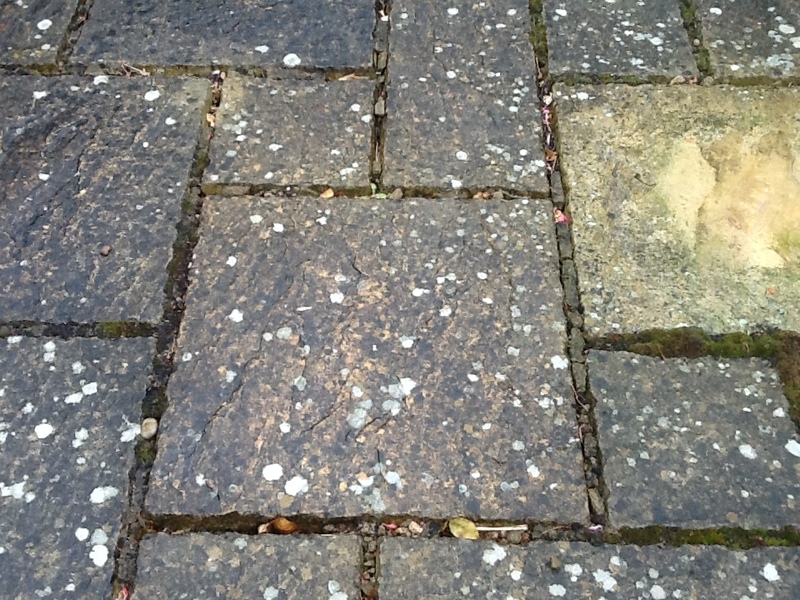 As you can see from the photos below, this cleaning made a great improvement to the condition of the patio – in fact, it appeared almost new again! The customer was very pleased with the outcome. 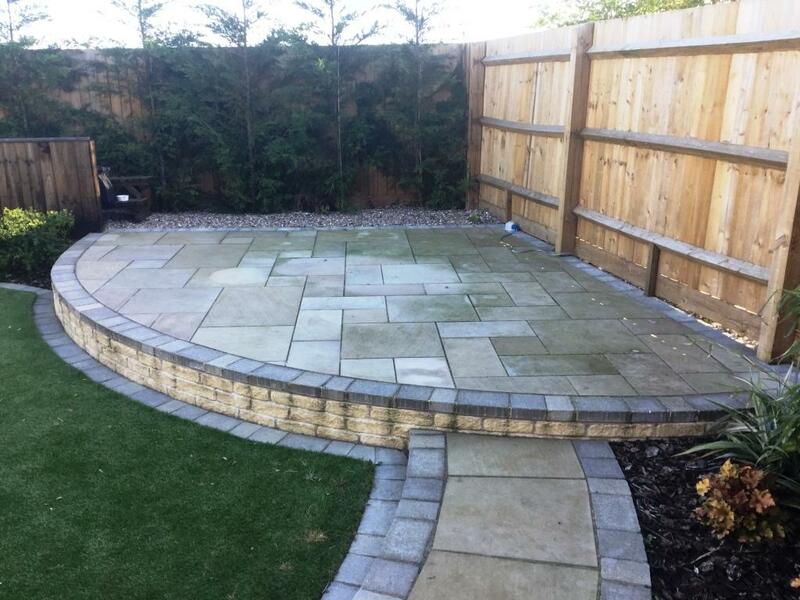 The customer decided not to have the patio sealed, as he preferred the natural look and would prefer to have it cleaned on a yearly basis. 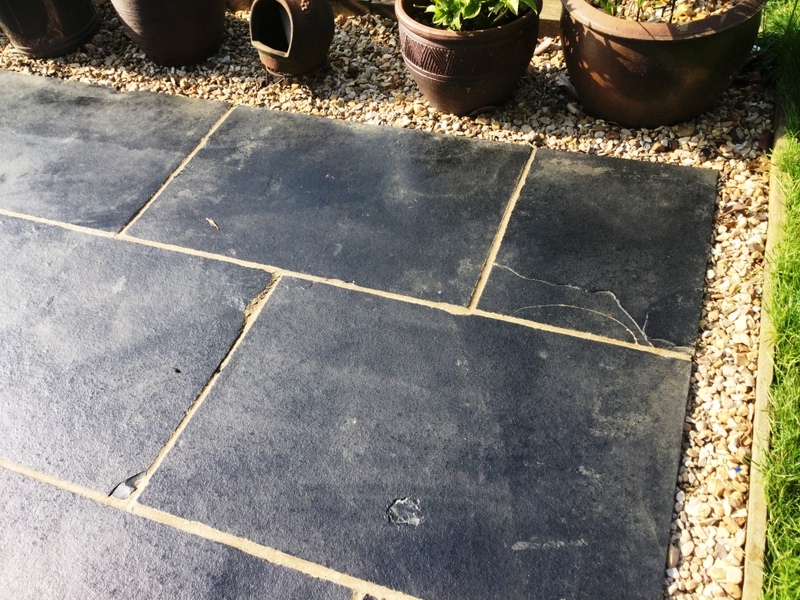 Sealing is less important for external tiles, as compared to internal tiles, however if you do decide not to seal your patio, it’s highly recommended that you establish a routine maintenance plan for the stone. 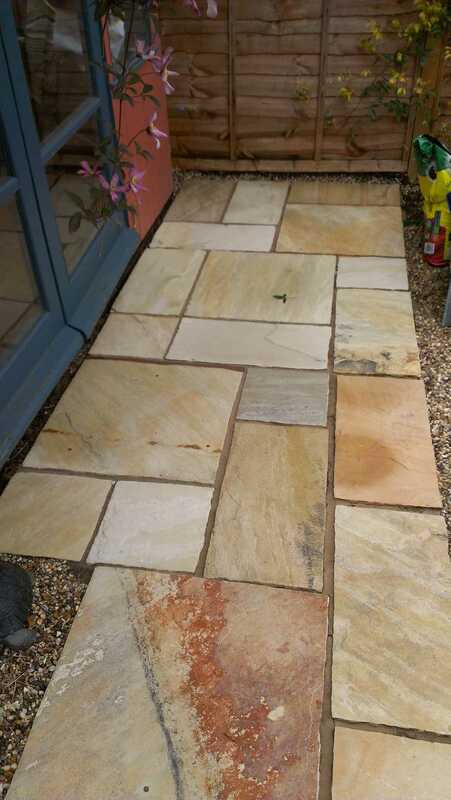 Otherwise, you run the risk – after just a few years – of allowing your tiles to end up in a similar condition to this Sandstone tiled patio before it had been restored. 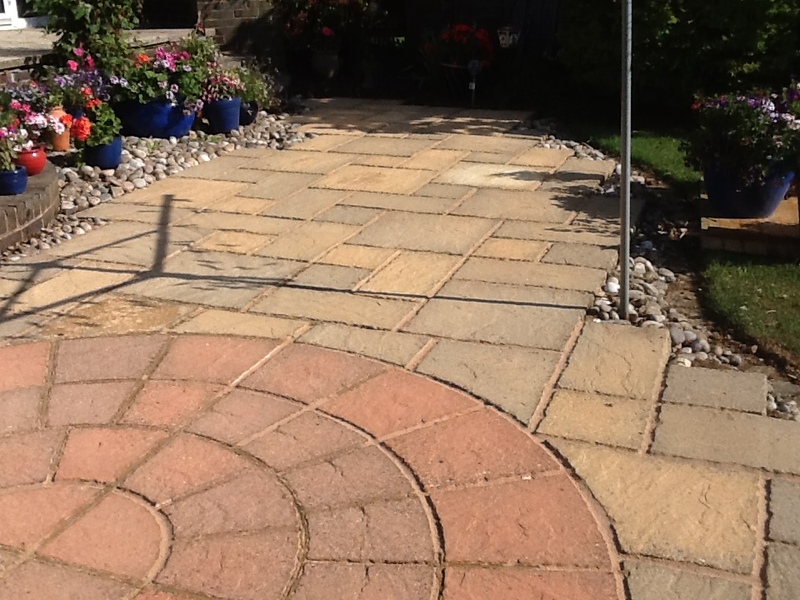 While most of our work involves the restoration of interior tiles, our equipment is also suitable for exterior stonework, including driveways and patios. Here’s a quick example of a brick driveway I restored recently in the old parish of Pertenhall, famous for its old Norman-age church, near Bedford. The driveway hadn’t been cleaned in a long time and had a serious problem with overgrown weeds and dirt. 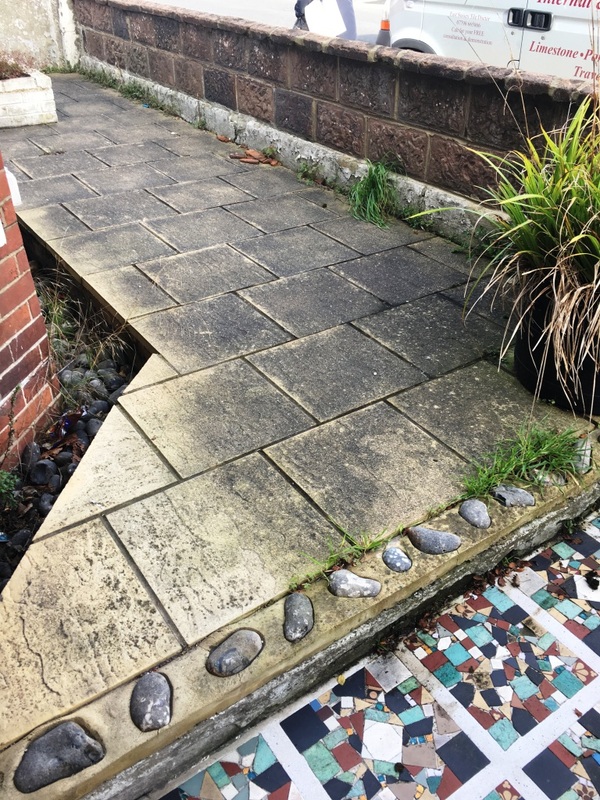 Needless to say, the property owner was keen to give it a new lease of life and this is something I would highly recommend if you’re looking to sell your property as improving curb appeal will ensure you make a good first impression. The restoration would take three visits to the property. On the first visit I tackled the weeds head on by applying a strong weed killer which needed to work its magic over a period of two weeks. 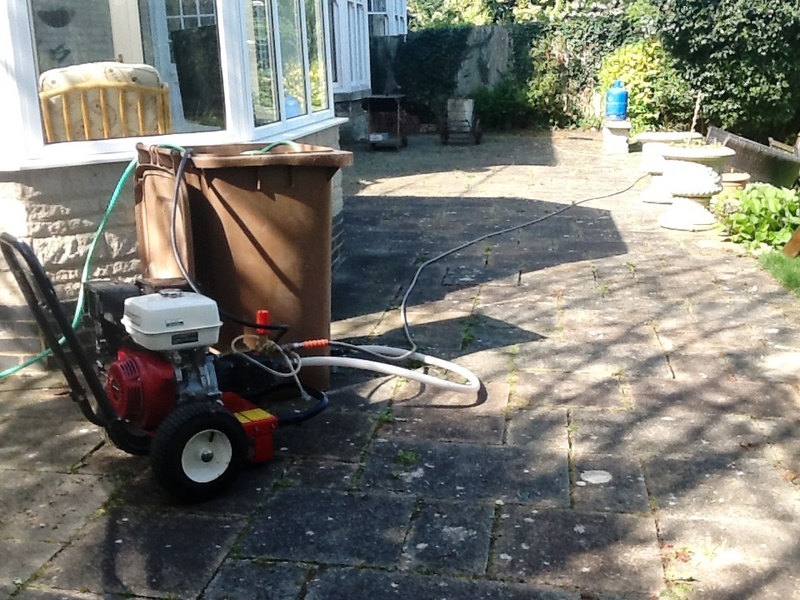 When I returned to the property the second time the weeds had died away and the driveway was ready to be pressure washed with my industrial, petrol-powered pressure washer. I returned to the property for a third and final time a few days later on a sunny day to find that the driveway had completely dried out. To finish the restoration, I applied some fresh kiln-dried sand to the gaps between the bricks and applied Tile Doctor Seal & Go Extra, a sealer which is approved for outside use. 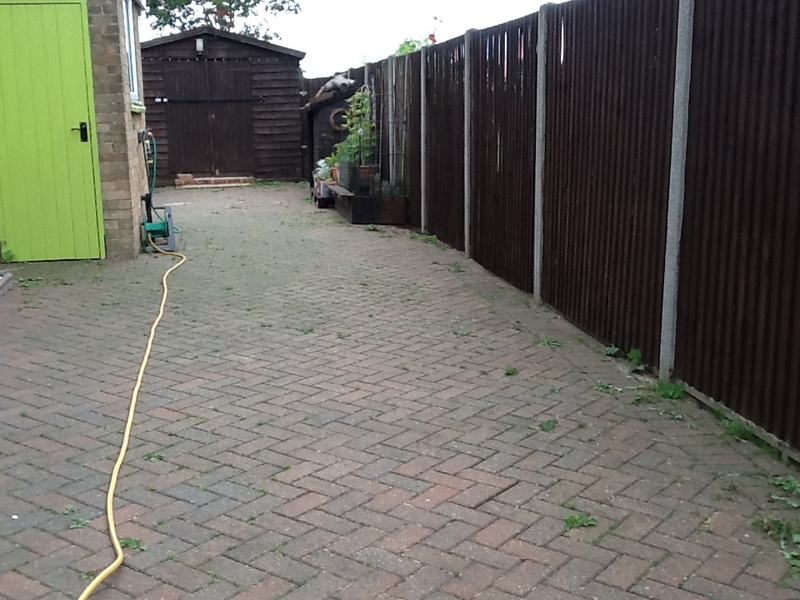 The customer was not only happy with the refreshed appearance of the driveway, but also reassured that the weeds would be kept at bay for quite some time. This is because the kiln dried sand and sealant prevents seeds falling between the brick blocks and taking root. Before leaving I advised the owner to brush and hosed down the driveway monthly as this will ensure its appearance is maintained for much longer. 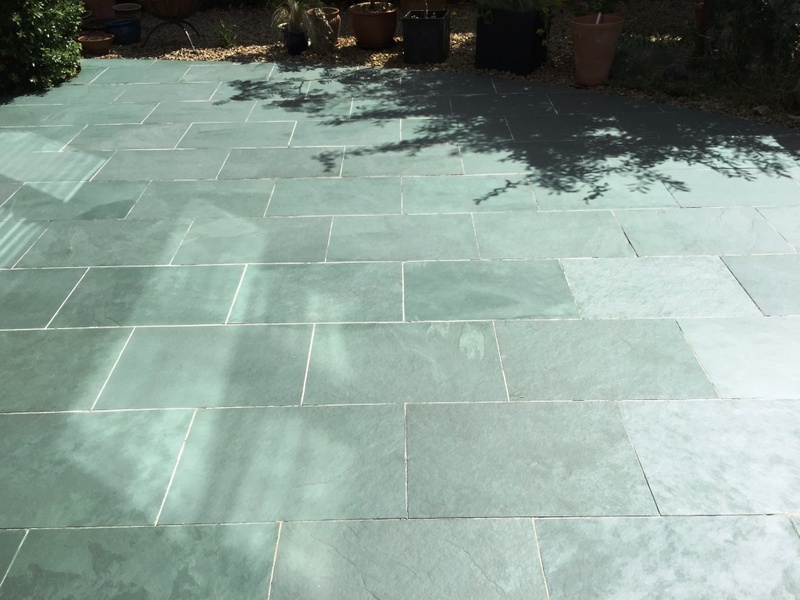 This patio, at a house in Windermere was made of fantastic Green Indian Limestone that despite sounding exotic is widely available in tile shops and building yards. 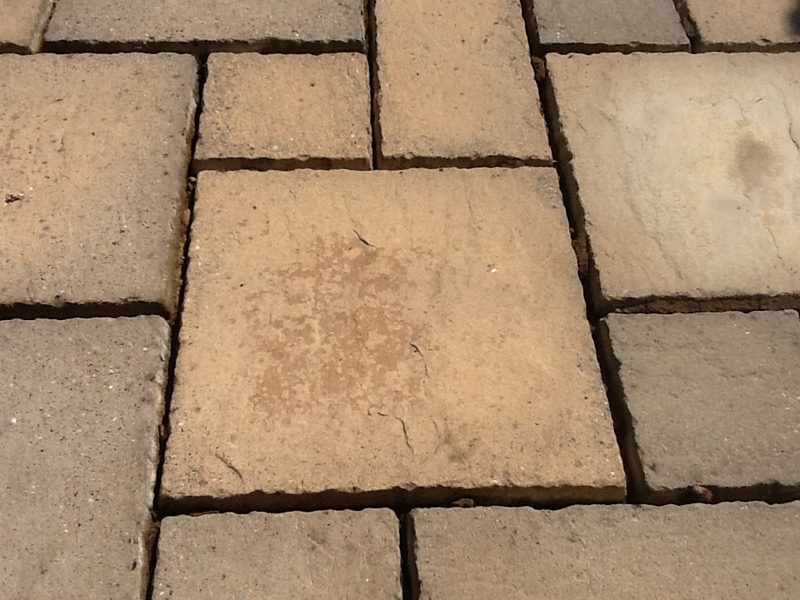 But while it is a very good quality stone, it doesn’t always make for a good patio tile. 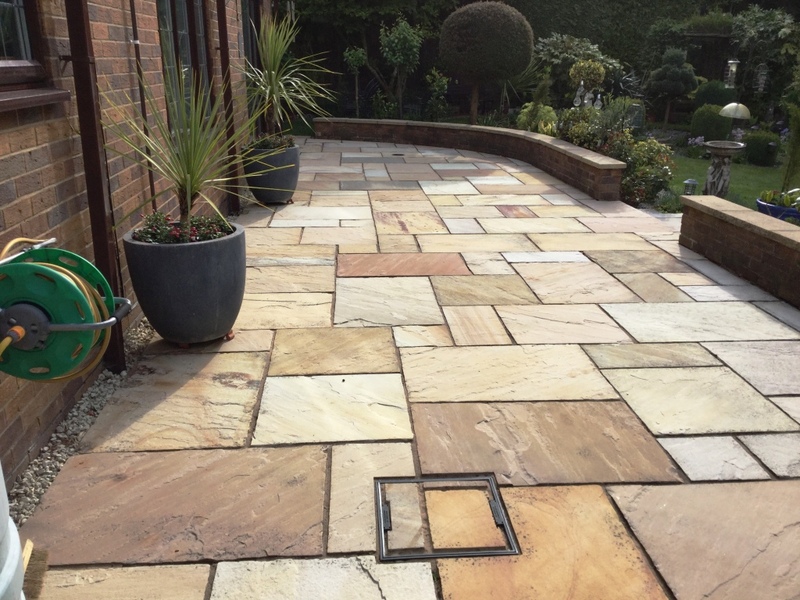 Tiled patios are rarely easy to keep clean, especially if they are made of a sensitive stone, like Limestone. 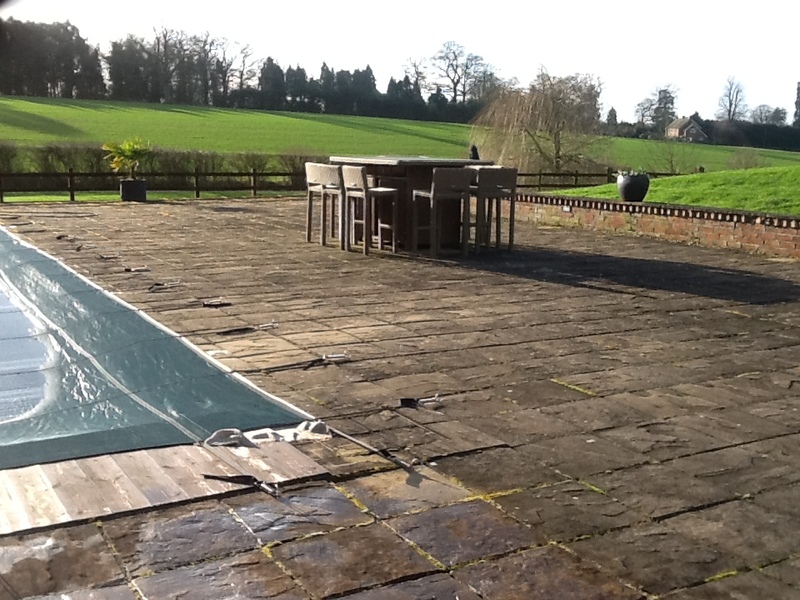 Over time, damage from weather and other environmental elements can leave these sorts of patios in really poor shape. The area at this property was covered in outdoor shrubs and trees, including Rhododendrons, which are prone to shedding their leaves. The leaves had intermittently fallen onto the acid-sensitive Limestone and, since the leaves are actually slightly acidic, they can leave some quite deep marks. Other trees with can have acidic leaves include Japanese Maples and Azaleas. 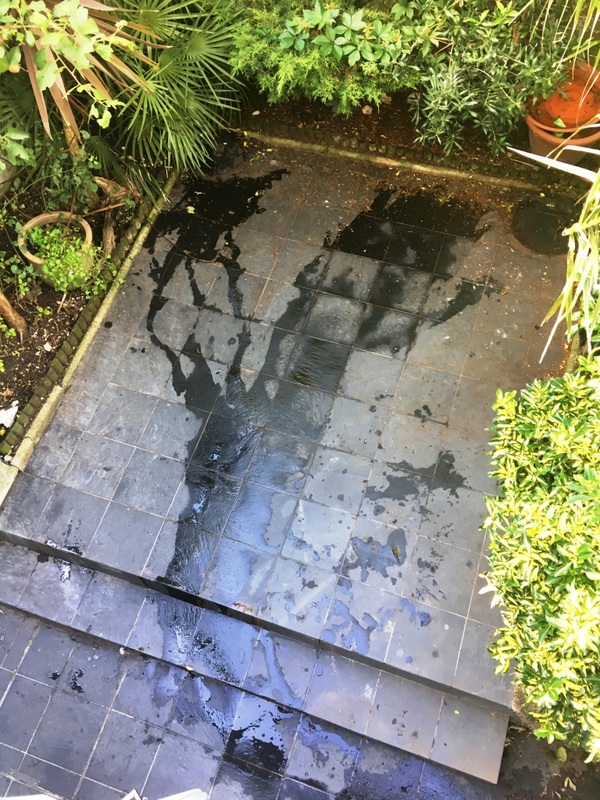 In this case, fruit berries from Rowan trees had also dropped onto the patio and crushed underfoot, leaving stains they had proven very difficult for the customer to remove. In fact, the customer was at the point of giving up on the patio. Power washing was having limited success, failing to remove the deeply embedded marks left by the leaves and berries, amongst other general wear and tear. 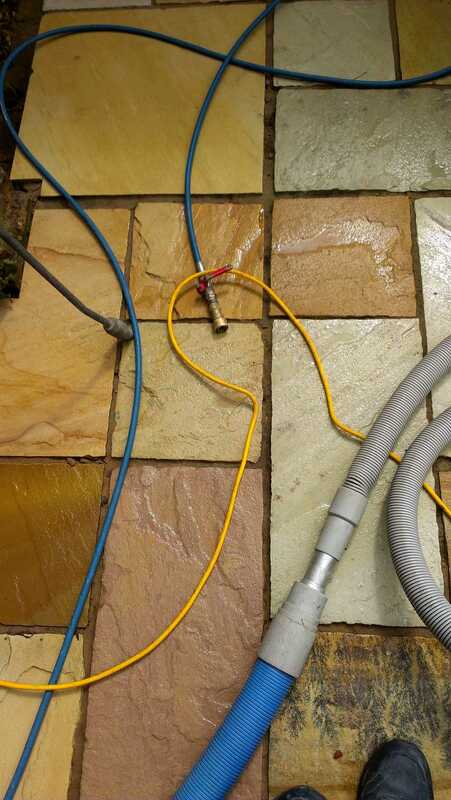 Thus the customer decided to turn to Tile Doctor for a professional cleaning service. 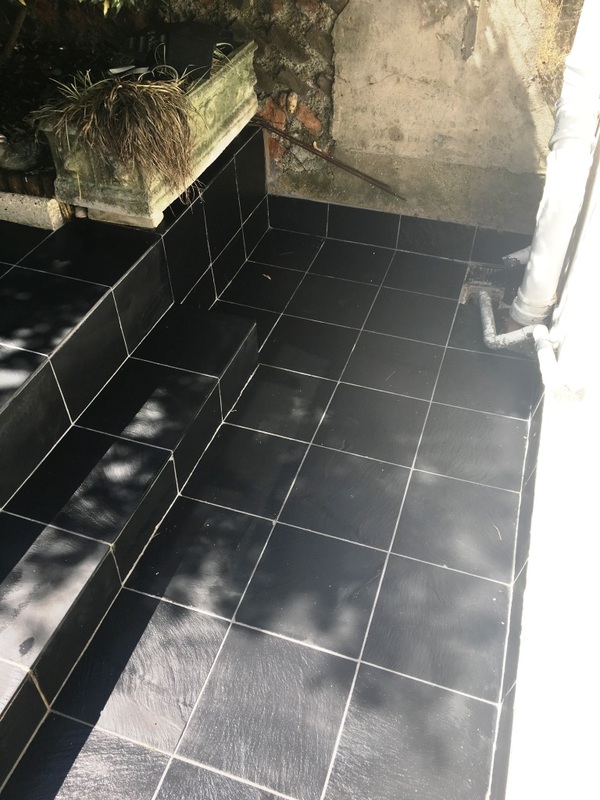 A year ago, this job would have been a challenge, but Tile Doctor recently bought out a product called Oxy Gel that proved to be an excellent cleaning product in this particular situation. Oxy Gel is a heavily concentrated alkaline cleaner in a gel form so it’s easy to handle. I applied this to the Limestone and left it to dwell for about 20-30 minutes to neutralise the acidic staining, before power washing and extracting the waste water. A certain amount of manual cleaning with a wire brush was required to remove the particularly stubborn marks, including underneath the Rowan trees where the fruit berries were prevalent. As you can see, the problem was quite excessive in these areas, and without the Oxy Gel even we would have found this job too much of a challenge. 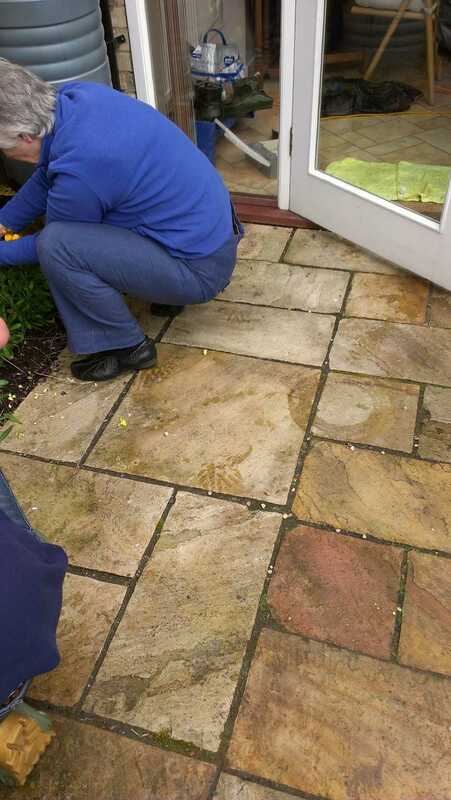 We also removed the dirty cleaning water containing the remains of the Oxy Gel using a wet vacuum, as this may otherwise have contaminated the garden soil. 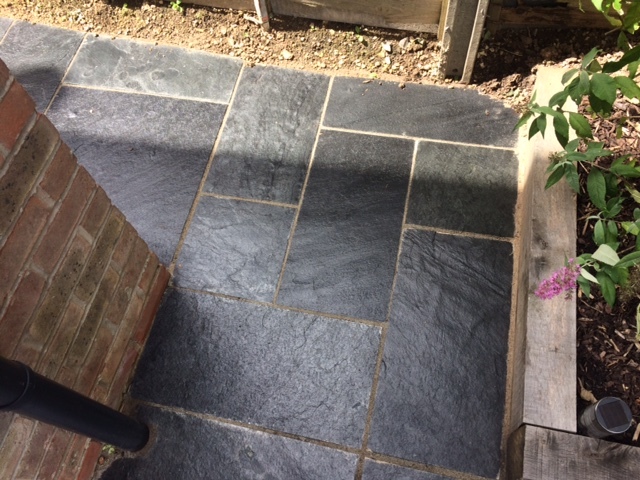 We didn’t seal the patio, as we don’t recommend sealing outdoor stone (although we will occasionally make an expectation with particularly sensitive Black Limestone). This is because external sealers generally can’t cope with exposure to acidic leaves and constant wet weather in the winter. What’s more, if the temperature falls below -5 degrees centigrade, the sealer will start to break up and crumble. 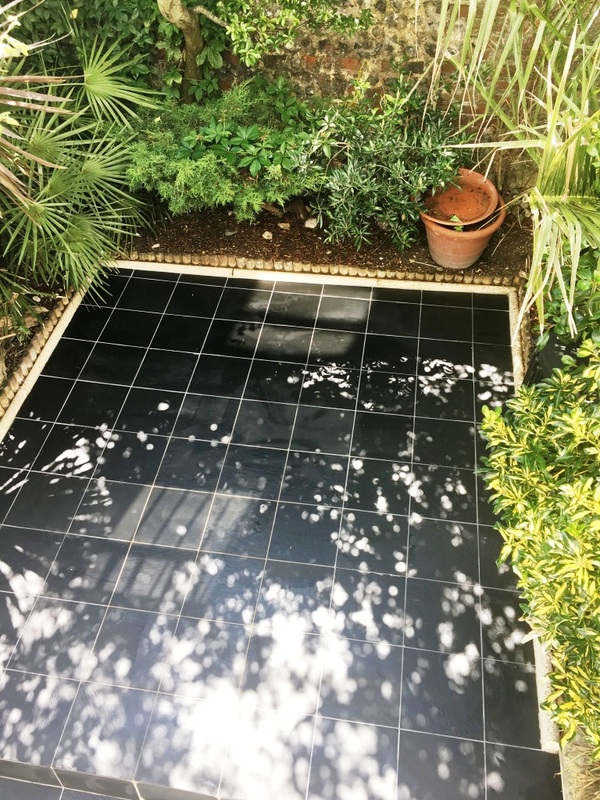 As I suggested to the customer, it’s best to power wash patio tiles twice a year – once in spring and once again in late summer. The results were absolutely fantastic considering the extent of the environmental damage. While such damages can’t always be avoided, this situation proves that with the right cleaning products and techniques, they can be reduced significantly. Needless to say, the customer was very happy with the transformation. 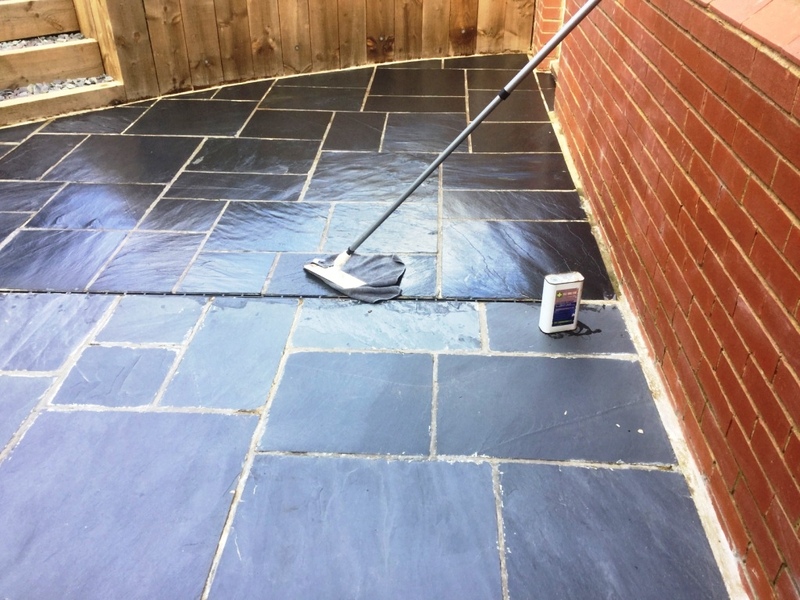 As the summer slowly approaches thoughts turn to sorting out those outside areas ready for use again, so it’s about this time of year I get asked to look at cleaning external tiled surfaces such as patio areas driveways. These external surfaces suffer from a heavily build-up of soils due to the general wear and tear caused by exposure to harsh weather conditions. 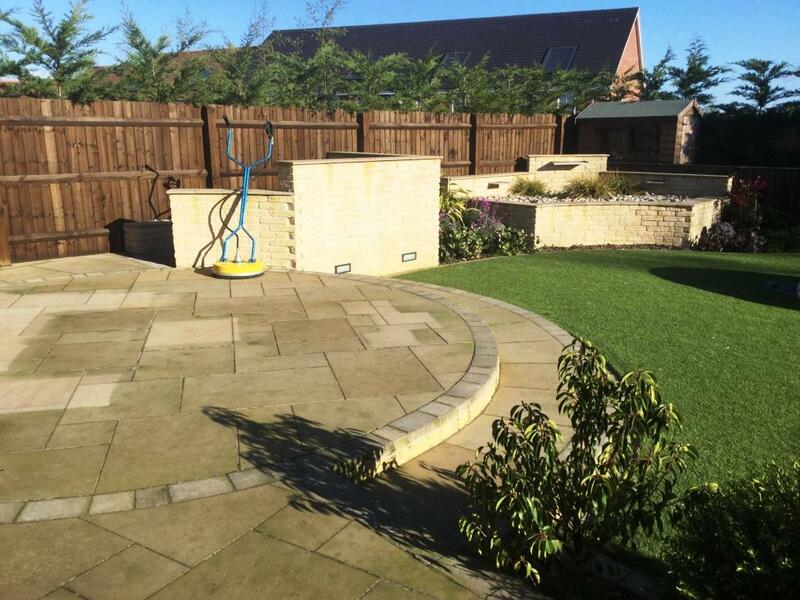 We have all the high pressure equipment and fantastic results can be achieved by pressure washing in combination with quality products. 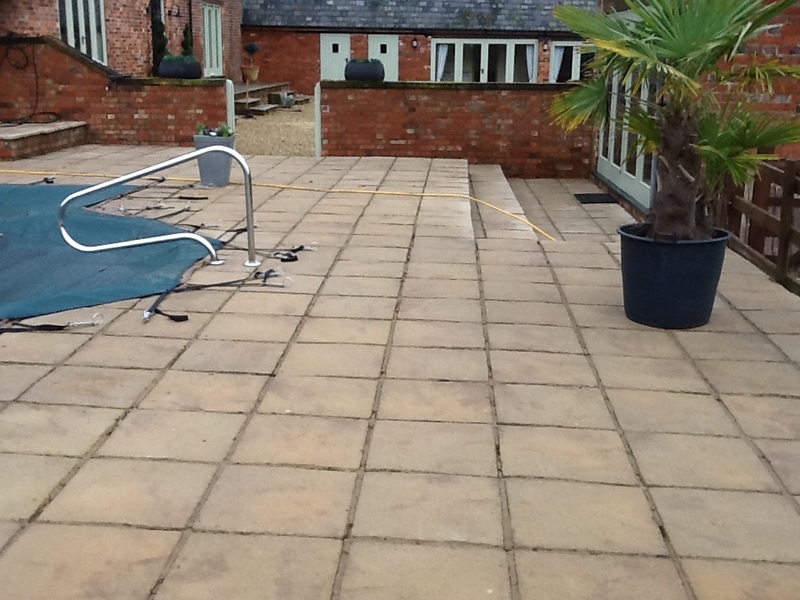 The photographs below were taken in January at a lovely property in the small village of Brockhall, near the market town of Daventry in Northamptonshire; my customer has a large Sandstone tiled patio and swimming pool area and as you can see the weather had certainly taken its toll and it was now in need of a thorough deep clean. 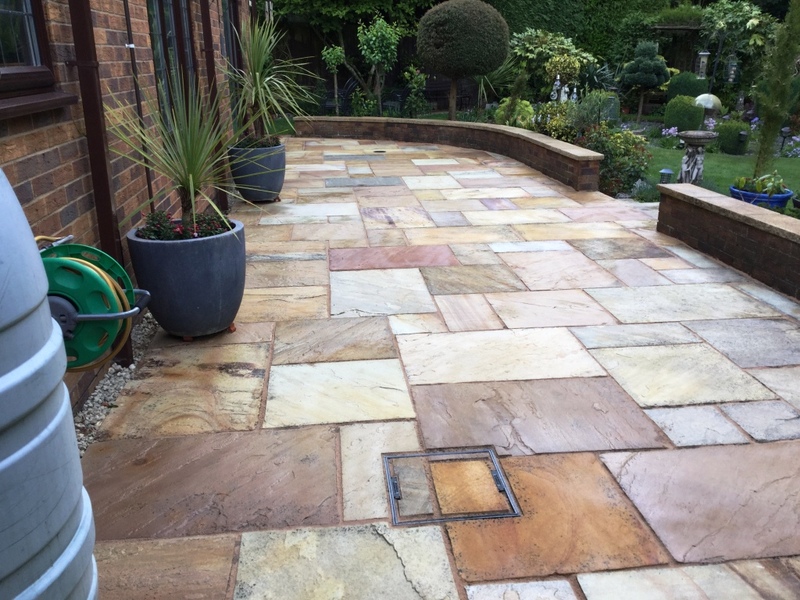 Sandstone is typically a hard wearing tile, but if neglected for a long time it can, much like any other type of stone, very easily lose its appearance without regular maintenance. 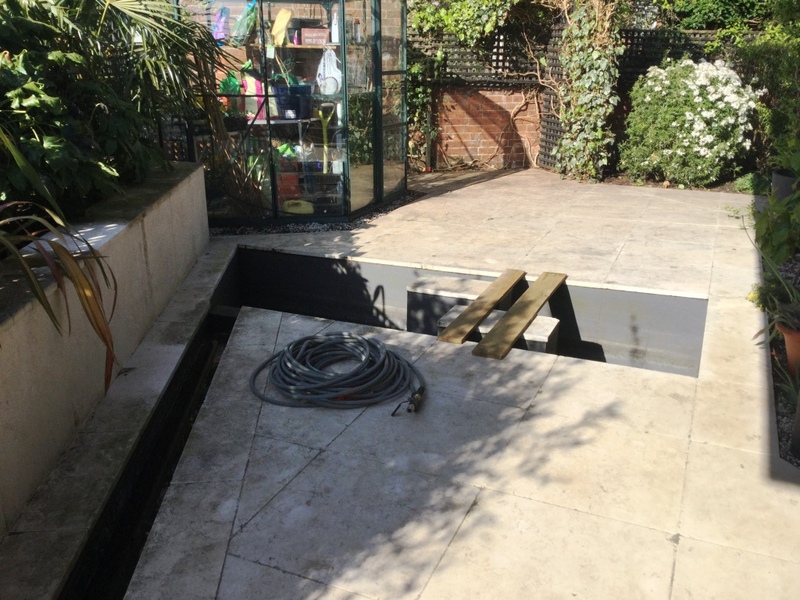 My first thought when dealing with swimming pool areas is to protect the pool from contaminates thrown up by the cleaning process, fortunately in this case the pool was well secured with a black cover which was tightly strapped down. 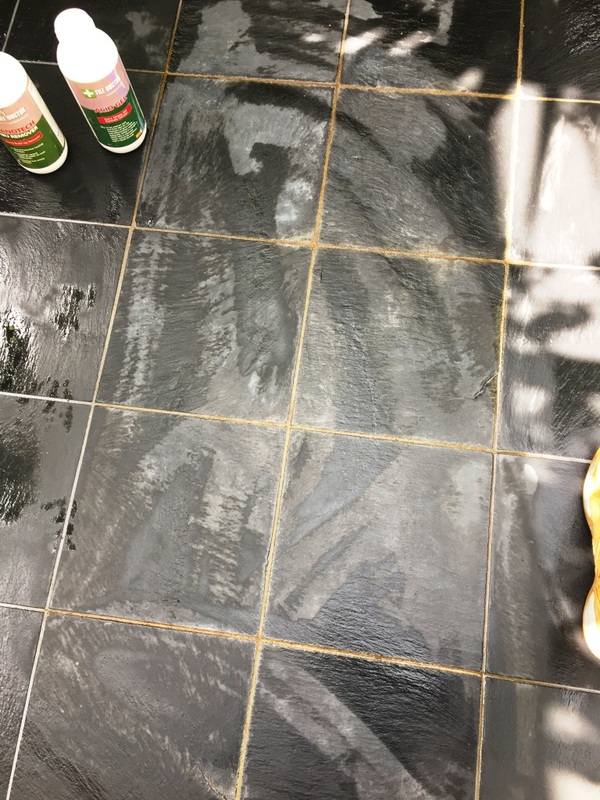 The next step was to deal with the particularly stubborn areas of dirt with an application of a high alkaline cleaner, known as Tile Doctor Pro Clean. 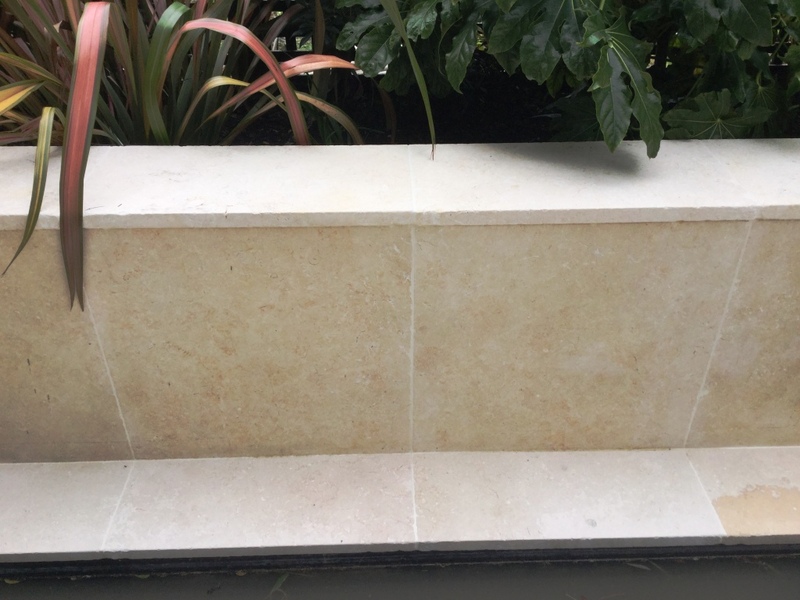 Being an alkaline based product Pro-Clean is suitable for use on many different types of natural stone tiles, including Sandstone, Granite, Limestone, Slate and Travertine, and can be applied to both internal as well as external surfaces. The cleaning solution was applied to the problem areas agitated so it could get to work on the dirt. 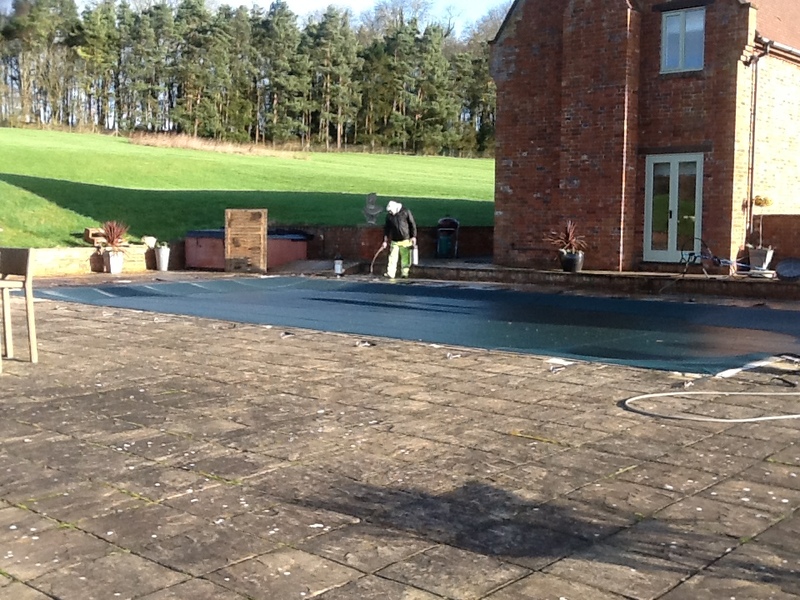 This was then followed up with the application of a special circular pressure washing spinning tool running at very high pressure. 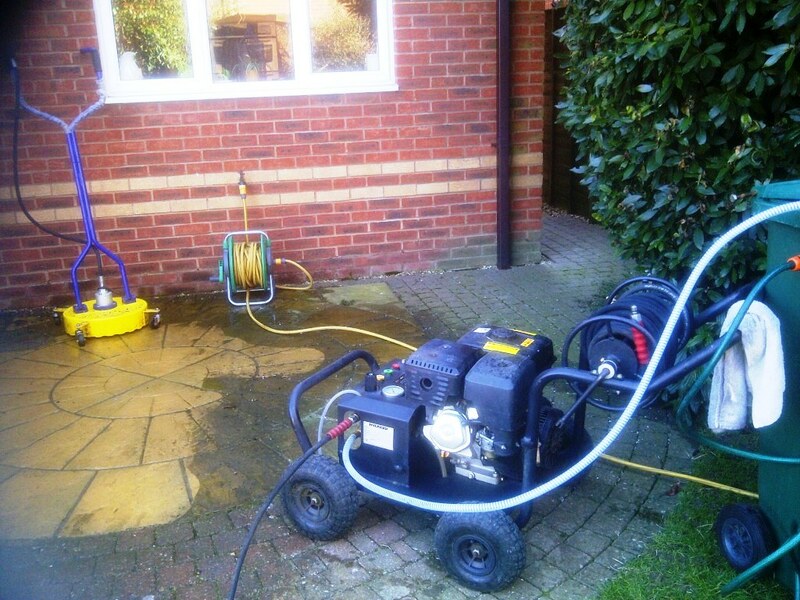 I have a truck mounted pressure system on the van however in this case it was easier to use a standalone industrial petrol jet washer to drive the spinning tool. The spinning tool allows the water to be applied under high pressure, and removes dirt and stains at the same time. As you can see from the photographs, the results achieved were amazing. My customer was so impressed, in fact, that he booked me in to restore his Sandstone tiled kitchen as well the following week! 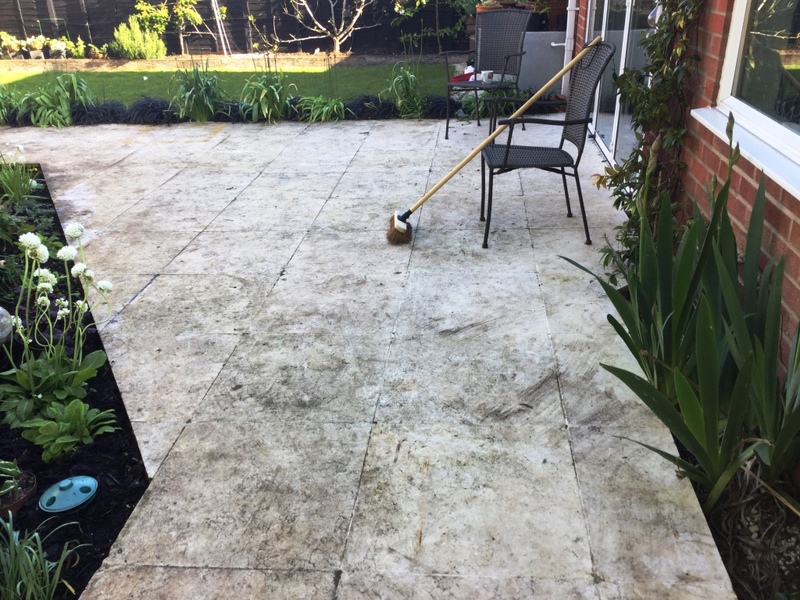 This Limestone patio had been poorly sealed, resulting in a lack of protection from weather and the general wear and tear of nature. 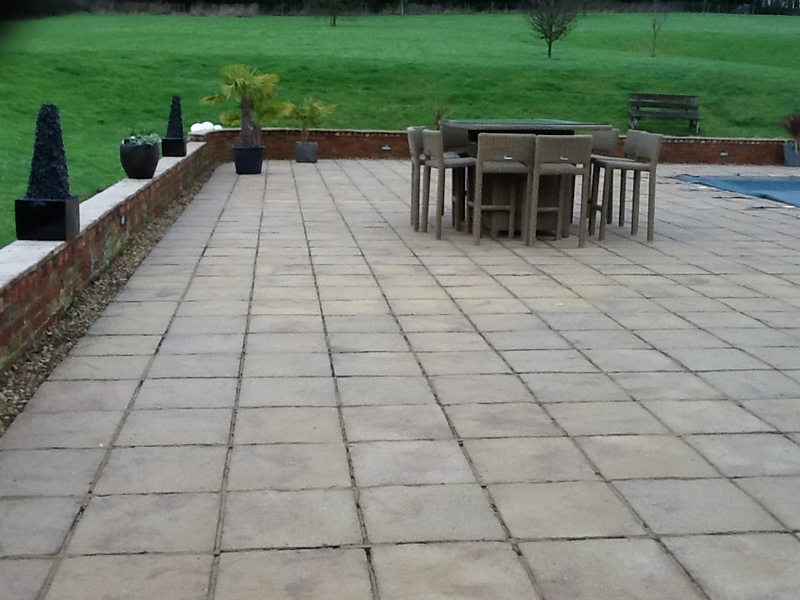 As such, the patio was in need of a thorough clean, and any remaining sealer stripped off and replaced. In addition, the pointing between the Limestone tiles was crumbling, and in places the stone was marked by oil spots. 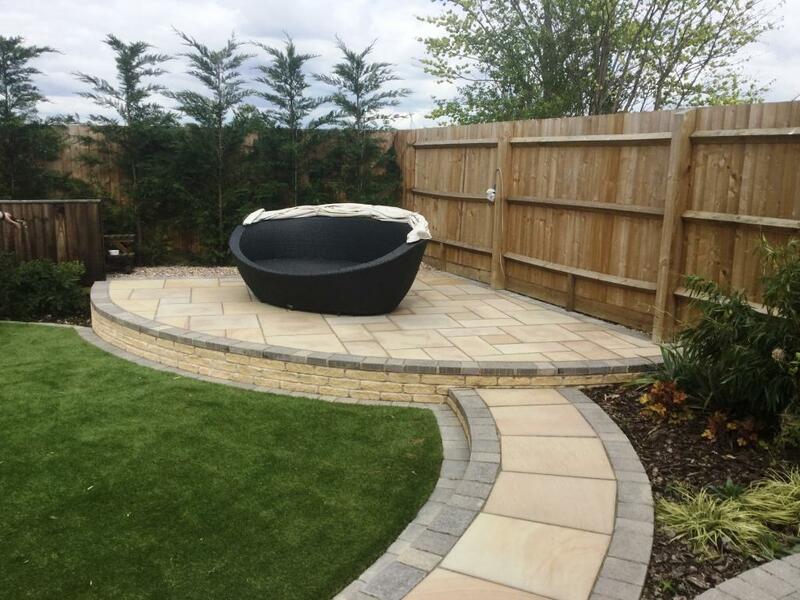 The patio was installed at a house in Ipswich, Suffolk which incidentally is considered to be one of, if not the oldest town in England. I knew the Limestone tiles would be difficult to clean, especially after being exposed to dirt and wear for so long so I figured this would take some time to resolve. 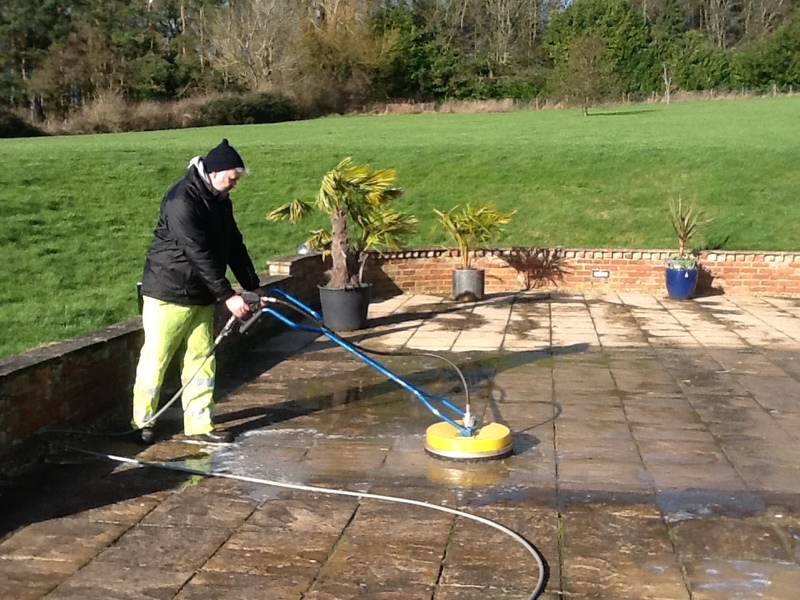 My first step was to give the patio an initial rinse with clean water in order to remove any loose debris. Following this, I mixed up an equal cleaning solution of Tile Doctor Pro Clean and NanoTech HBU. 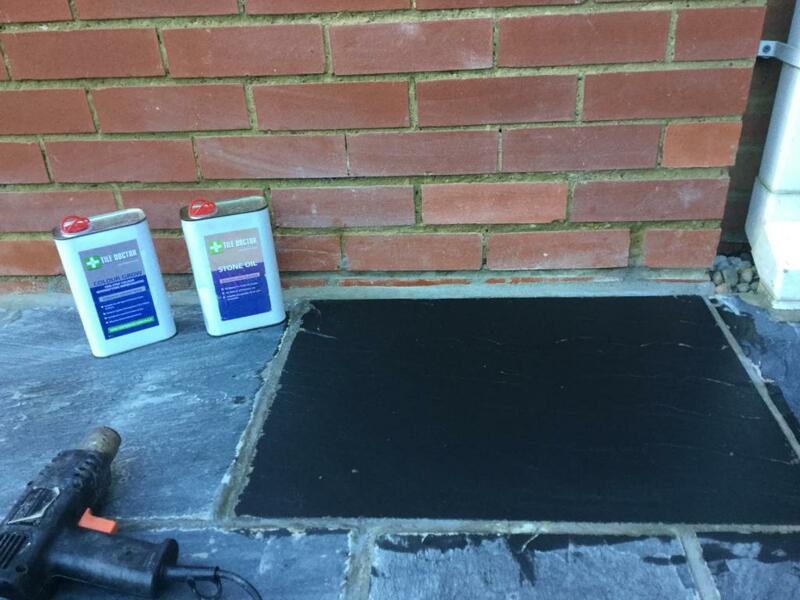 Pro-Clean is a versatile, high alkaline cleaner which can be used on a variety of natural stone floors, whilst NanoTech HBU (formerly known as Ultra Clean) is specifically designed to tackle the heavy build-up of dirt and stains. It does this by using nano-sized particles to penetrate beneath tough stains to dissolve and lift them out. As you can see from the photographs, the combination of the two cleaning products was highly effective. After completing the cleaning, I left the house for two days to allow plentiful time for the patio to dry completely, and therefore ready to be sealed. 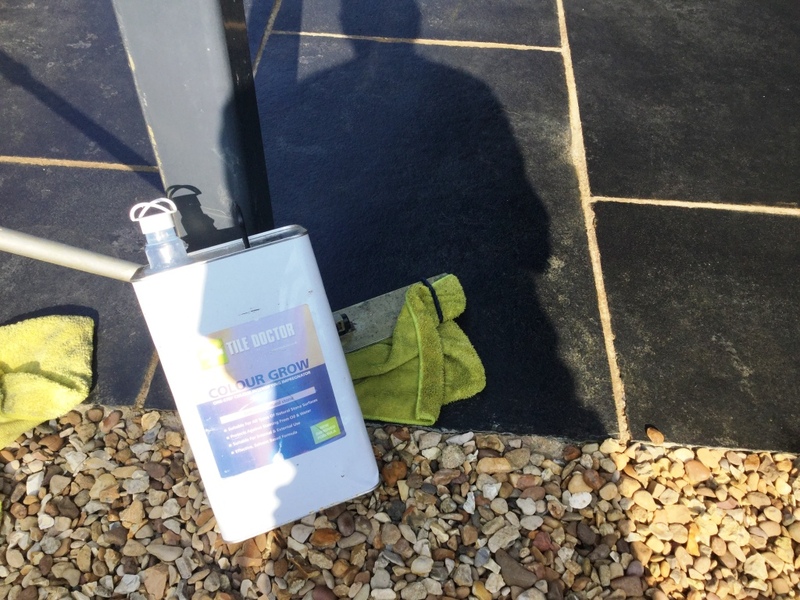 Fortunately the weather held and I was able to call in as planned and applied Tile Doctor Stone Oil, an easy-to-apply product that adds colour to the stone. I left the floor for a further two days and then returned again to protect the Limestone using a couple of coats of Tile Doctor Ultra Seal. 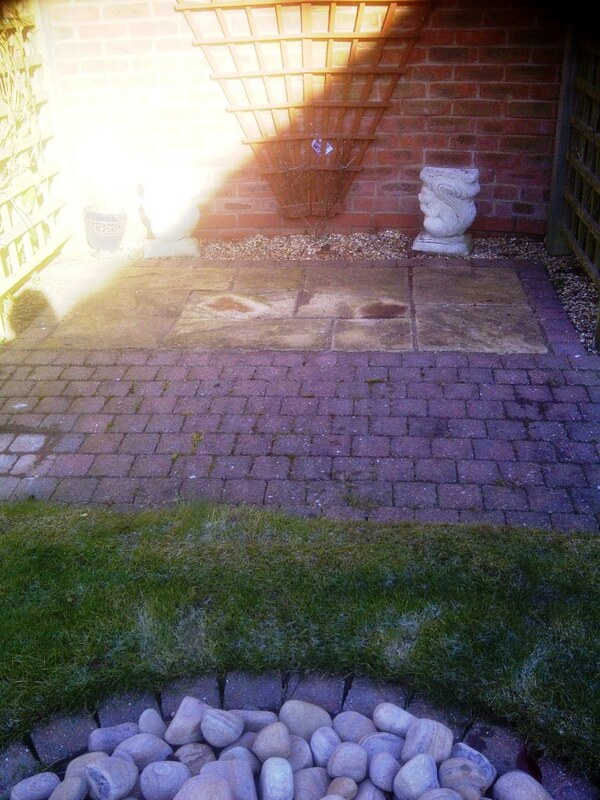 After cleaning and sealing the patio, my final task was to deal with the pointing issue. 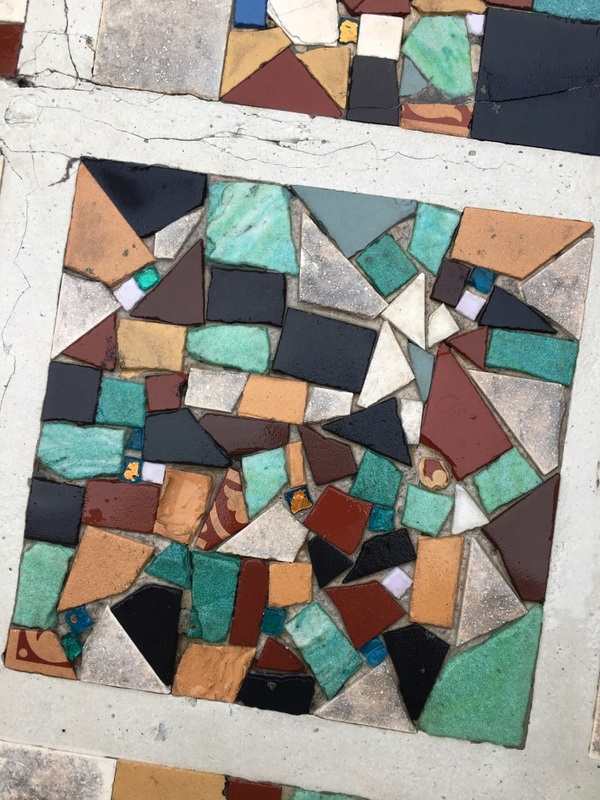 I replaced any missing pointing and fixed the loose pieces, before colouring the grout using a dark colourant to provide uniformity. 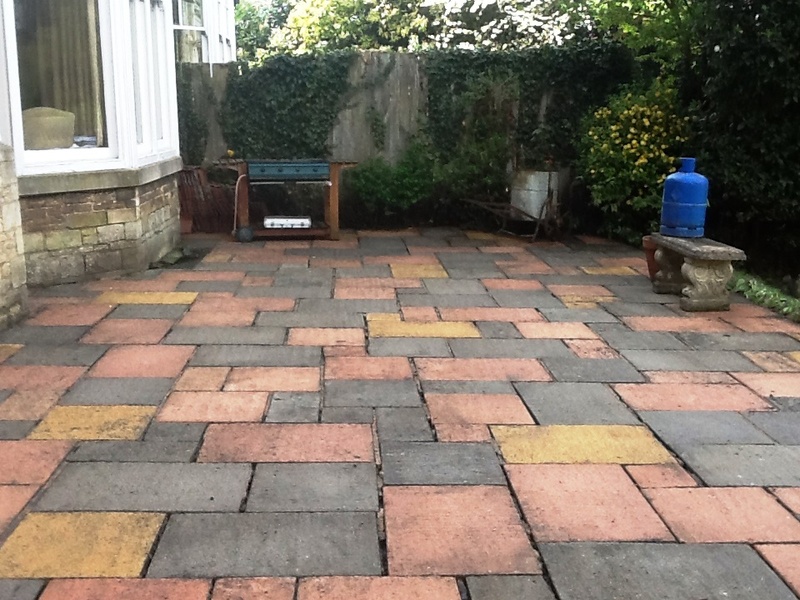 This was difficult, but highly rewarding work, as the patio now looks bold and inviting. 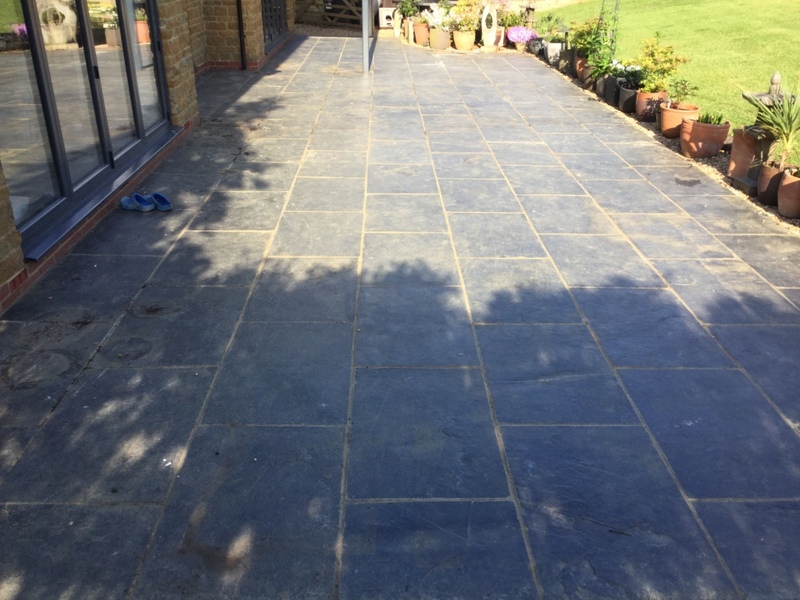 Back here with another job, this time in the small commuter town of Chinnor in Oxfordshire to clean and seal a Slate patio which was looking worse for wear. 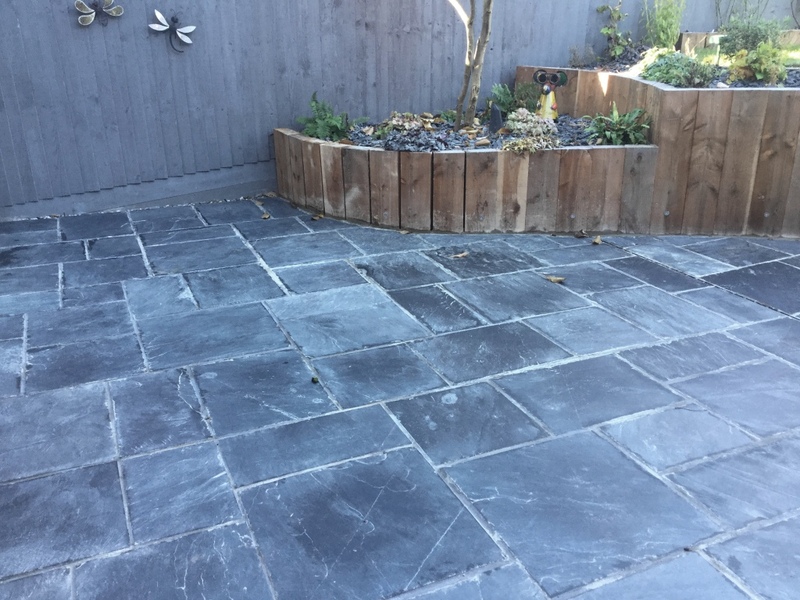 Slate is a highly durable material that is a popular choice not only for external flooring such as patio, but also for internal flooring in high traffic areas like kitchens and hallways. A few days before I began the cleaning, I visited the property in order to rake and re-fill the grout. 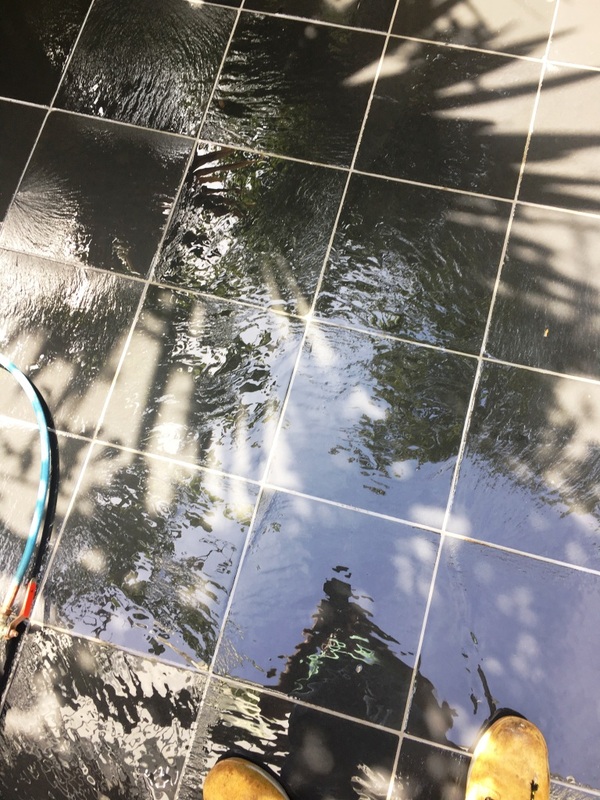 Working in sections, I began the cleaning process by pre-wetting the individual area of the patio, before applying a dilution of Tile Doctor Pro Clean. 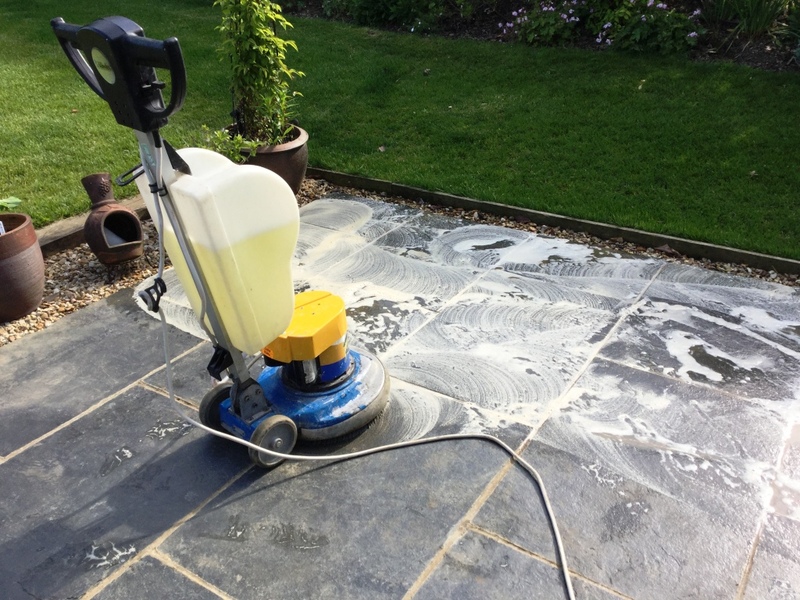 I use Pro-Clean as a cleaner for several different types of stone flooring, whether internal or external, as it is very good at getting underneath the dirt and lifting it out, being an alkaline it’s also safe to use on all types of Tile and Stone. The solution was left to on the surface to dwell for a while, before scrubbing in with a medium brush attached to a floor machine. Once I had finished cleaning, I used a wet-vac machine to remove any watery residue before rinsing the area with clean water, and soaking up the excess once again with the wet-vac. I repeated this same process for the entire patio. Before beginning the sealing process, I ensured that the floor was completely dry, as any excess moisture could have impacted negatively on the performance of the sealer. 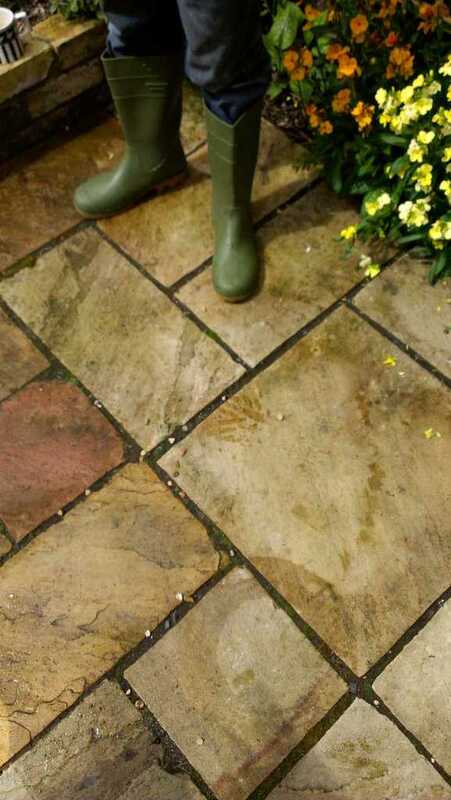 My sealer of choice was Tile Doctor Colour Grow, a colour enhancing, impregnating sealer; two coats were sufficient. 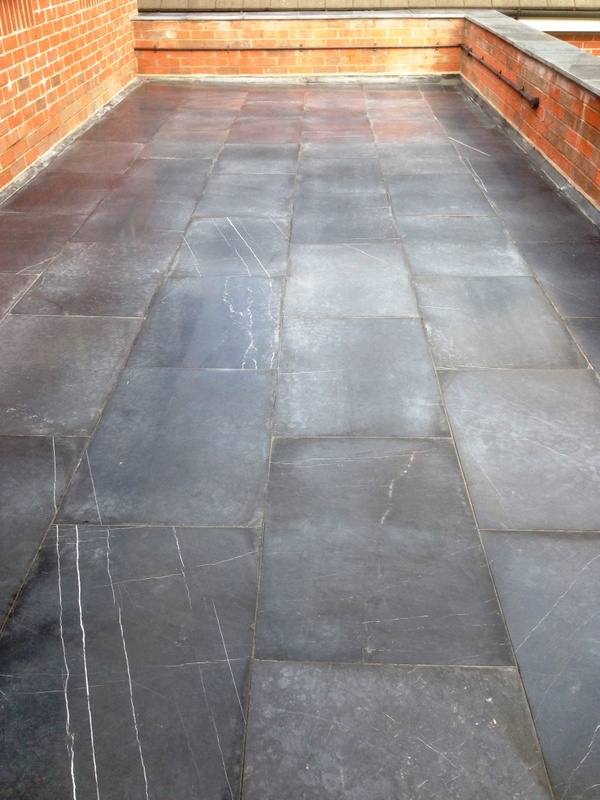 As an impregnating sealer, Colour Grow works its way into the pores of the Slate, providing durable surface protection from within. In addition, the colour intensifying properties of Colour Grow bring out the natural colours and shades in the surfaces to which it is applied. 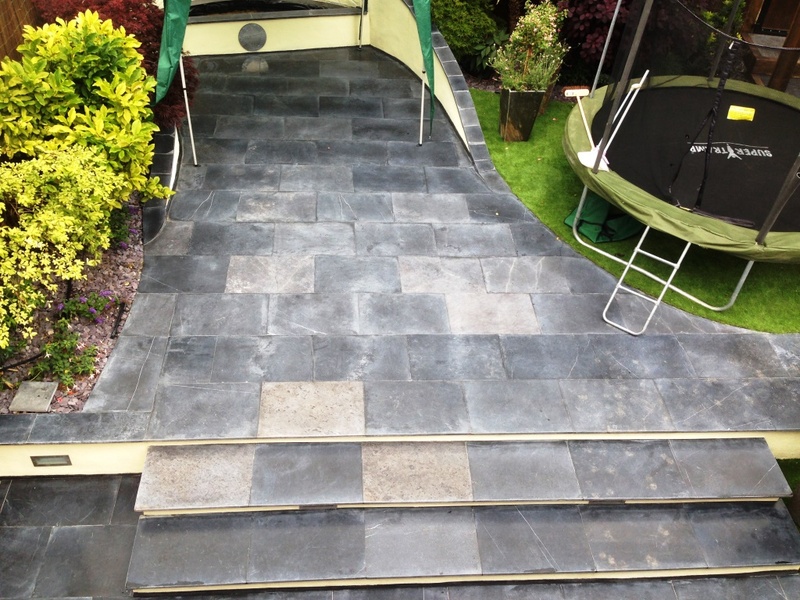 The finished result, as you can see from the photos, was quite a different look for this Slate patio. 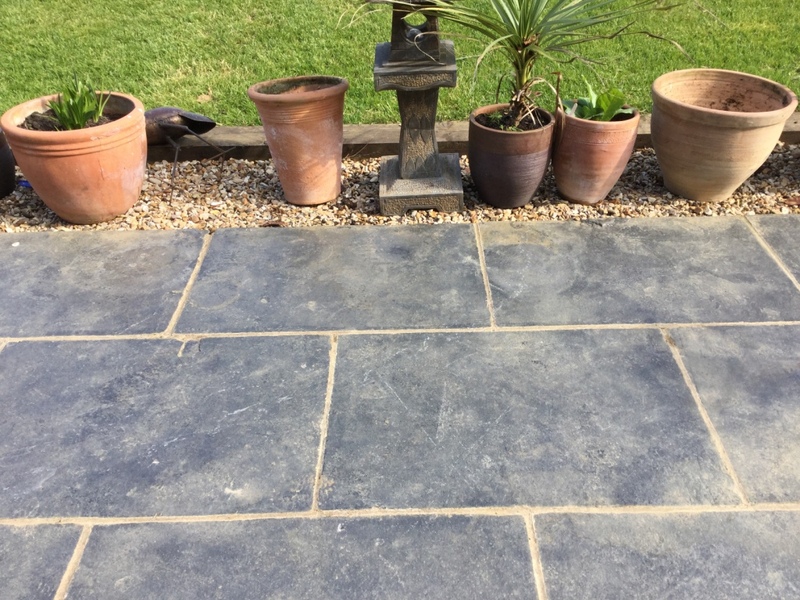 The many layers of grime and dirt had previously hidden the fantastic character of the tiles, but with a good clean and colour enhancing seal, the patio was brought back to life. Both myself and my client were very pleased with the outcome. 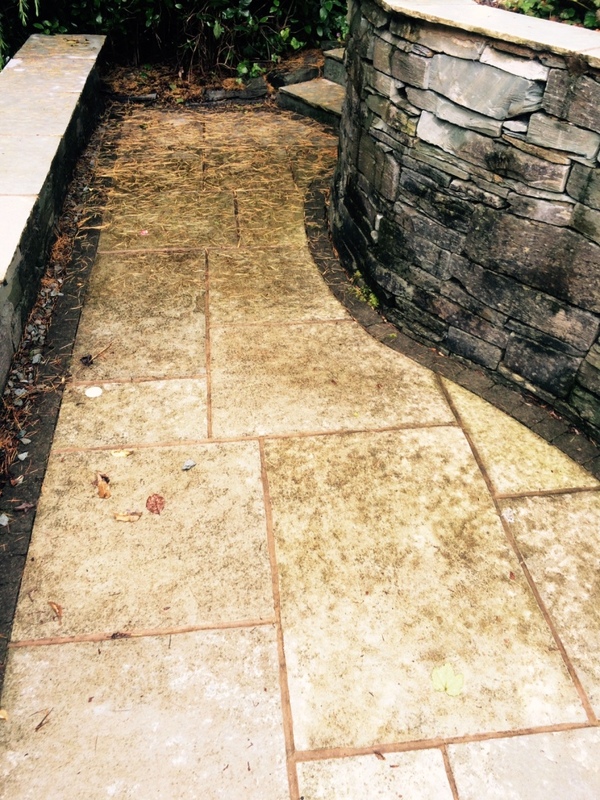 Details below of a Limestone patio I was asked to clean at a property in the affluent neighbourhood of Alderly Edge, Cheshire, famous for being the home of choice for several Premier League footballers. In fact Alderly Edge, which lies not too far south of Manchester and is one of the most sought after places to live in the UK. 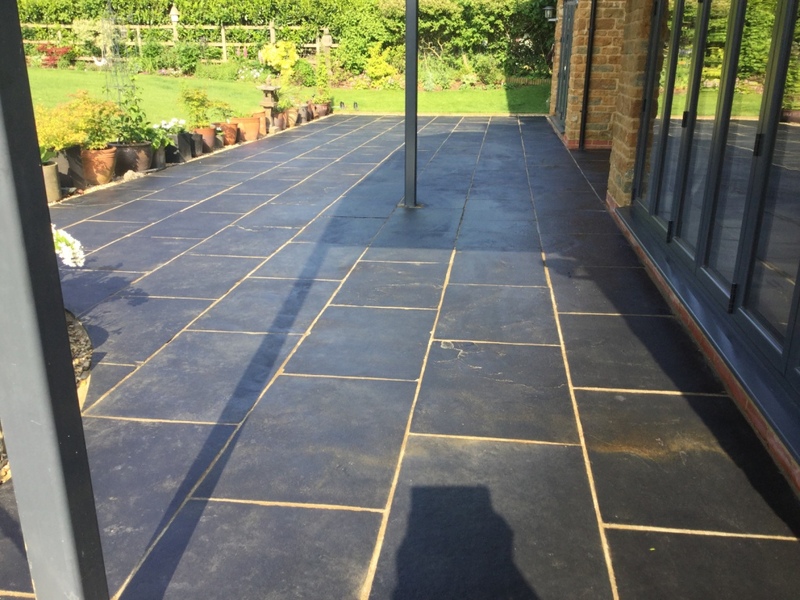 My client was unhappy with the look of the patio had previously been sealed using a topical sealer, and this had left the tiles looking dull and lifeless. 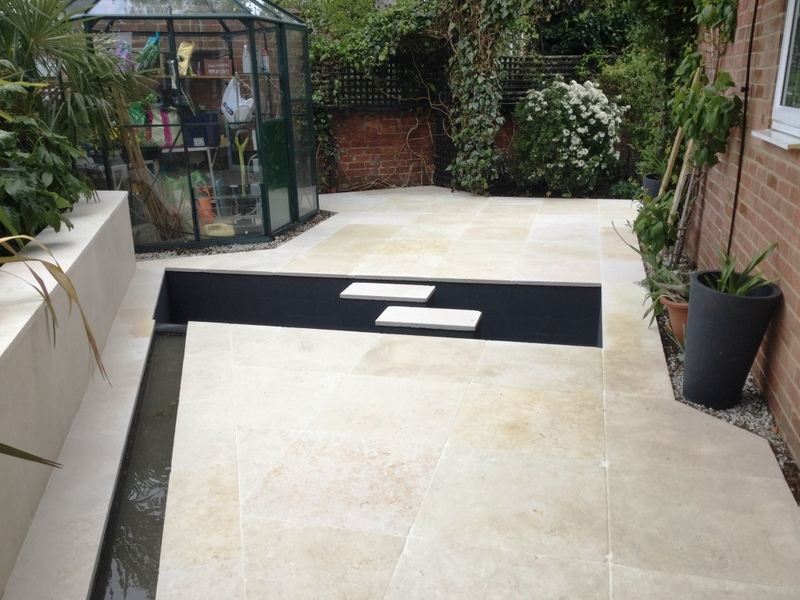 Limestone is a fantastic natural stone, popularly used for internal floors as well as patios, it comes in a variety of fantastic colours and shades. 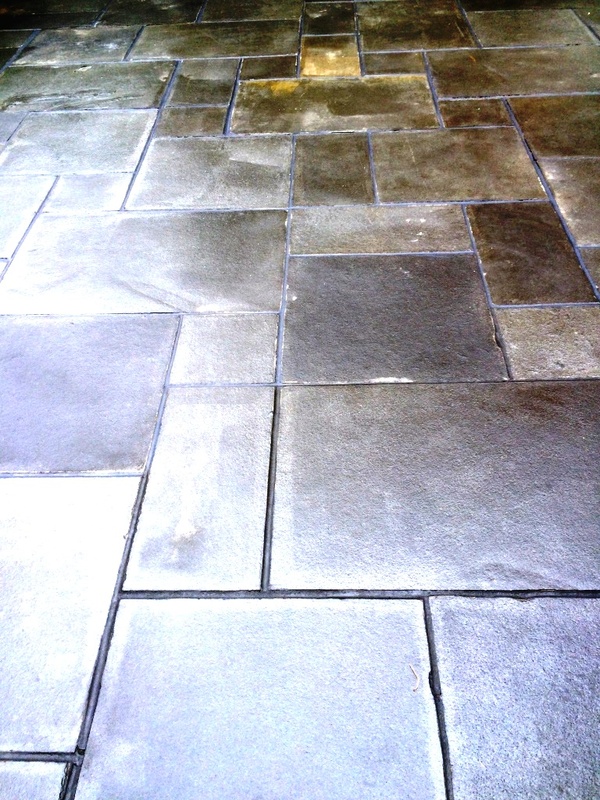 What my client really wanted for the patio was a wet look to bring out the character of the Limestone. So, my job was to strip the old sealer off and replace it will one that would achieve the desired finish. 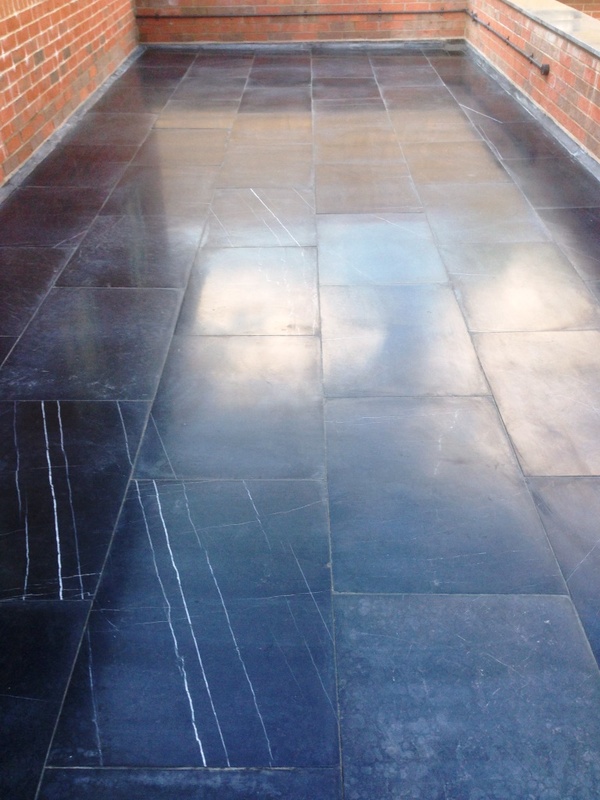 To strip the old sealer from the patio, I used a series of fine diamond encrusted burnishing pads which are applied in order from Coarse, Medium, Fine and then Super Fine. The coarse pad is effective at stripping off sealer without damaging the tile, and without the need to use a liquid product. The finer burnishing pads then rebuild the appearance of the Limestone to provide a nice deep shine. 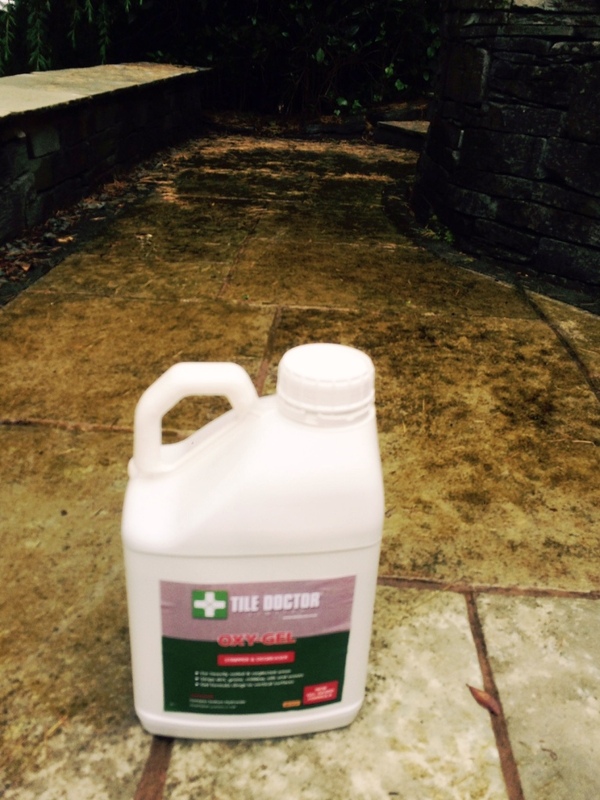 The new sealer of choice was Tile Doctor Colour Grow, which can be used on both internal and external natural stone surfaces. 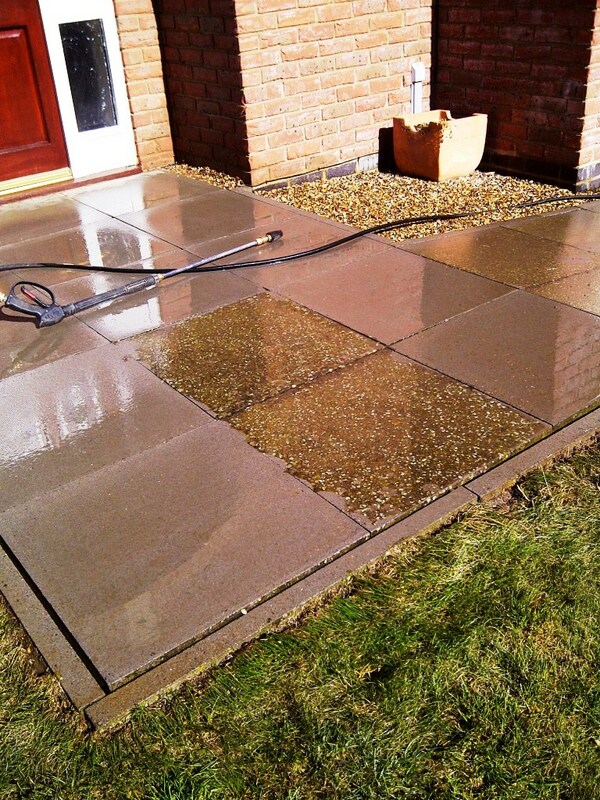 Colour Grow is an impregnating sealer which penetrates deep into the pores of the stone, providing both long-lasting resistance and durable protection against ingrained dirt and stains. 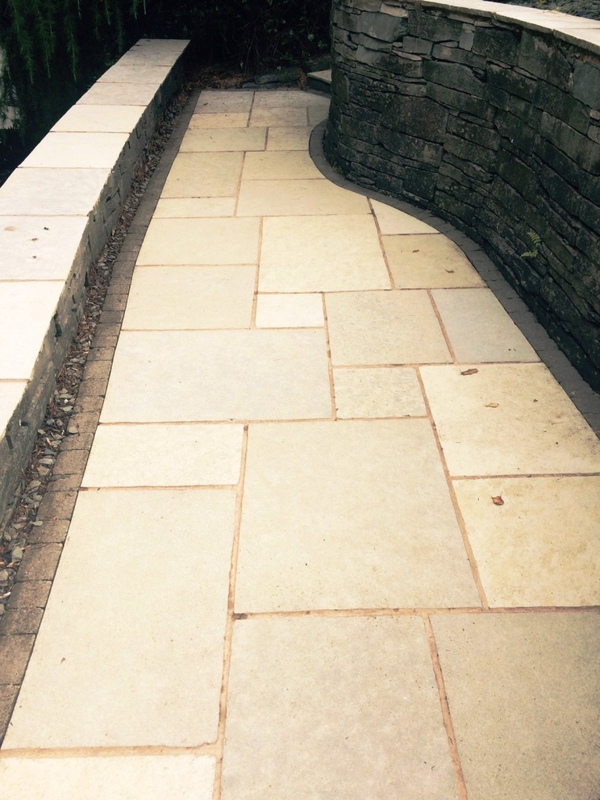 As you can see from the photos, Colour Grow is also specially formulated to intensify the natural colours in the stone, and it really helped to bring the Limestone back to life again. 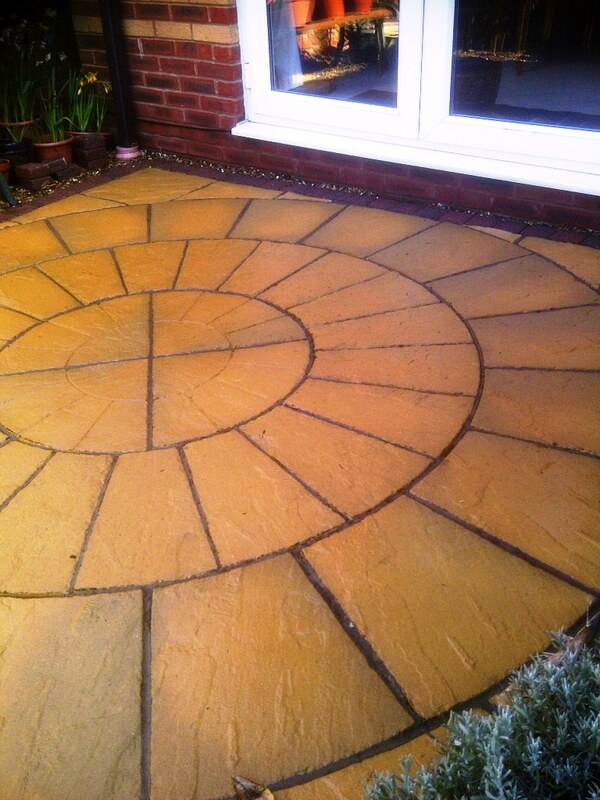 The finished job left this patio with the wet, polished look my client had requested. She was very pleased with the result and amazed by just how quickly such a marked difference could be made. Another happy client! 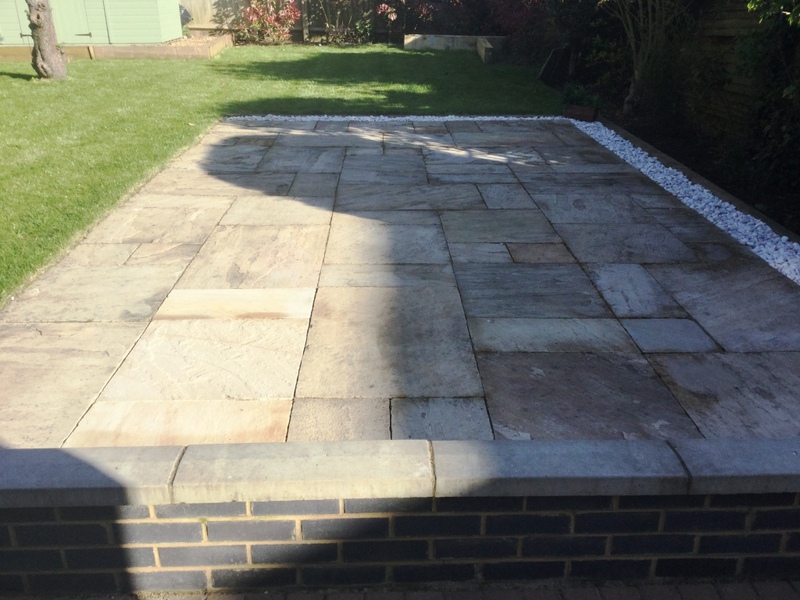 Just so you know we don’t just clean stone and tile floors we also do external patios as well and this particular job was at a property in Cambridge with a Sandstone patio. 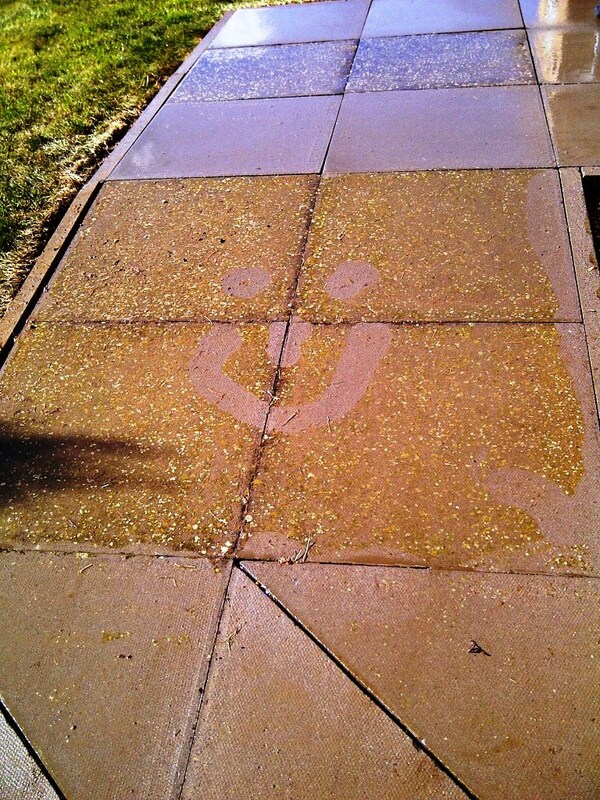 We have all the tools and products to clean most surfaces so cleaning patios and brick paved driveways isn’t a problem. The process was quite straight forward and involved pre-soaking the driveway with Tile Doctor Pro-Clean, it’s a versatile cleaner that equally effective on Patios as well as Tile, Grout and Stone; being an alkaline cleaner it has the added advantage that it doesn’t cause damage to the surface that typical acid cleaners can. 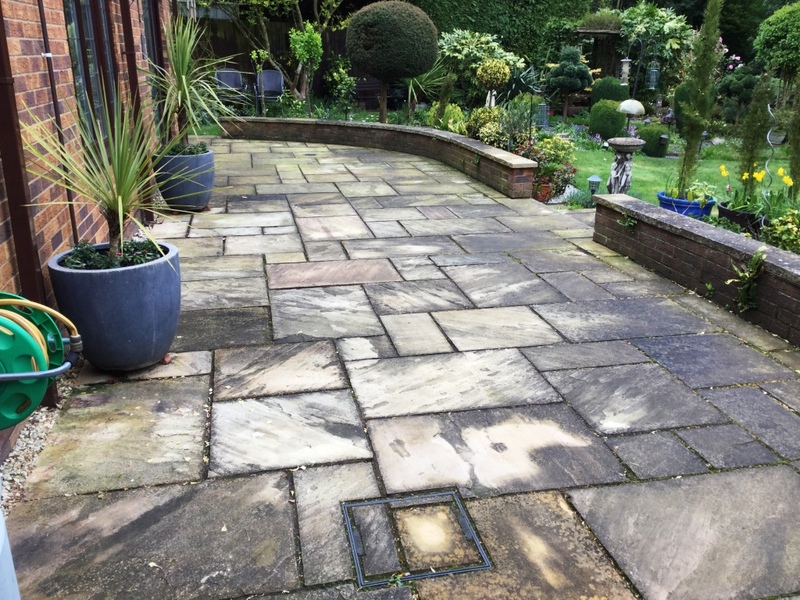 The Pro-Clean was left to dwell on the patio for a good hour before scrubbing it in with a stiff brush and following up with a high pressure professional jet washing machine which did a great job dislodging the grime that had built up on the surface over time. You can see from the photographs what a difference it made. Pressure washing can dislodge the grout joints so once we were done cleaning the floor the gaps between the tiles was filled in kiln dried sand. I think you will agree the patio looks good as new. 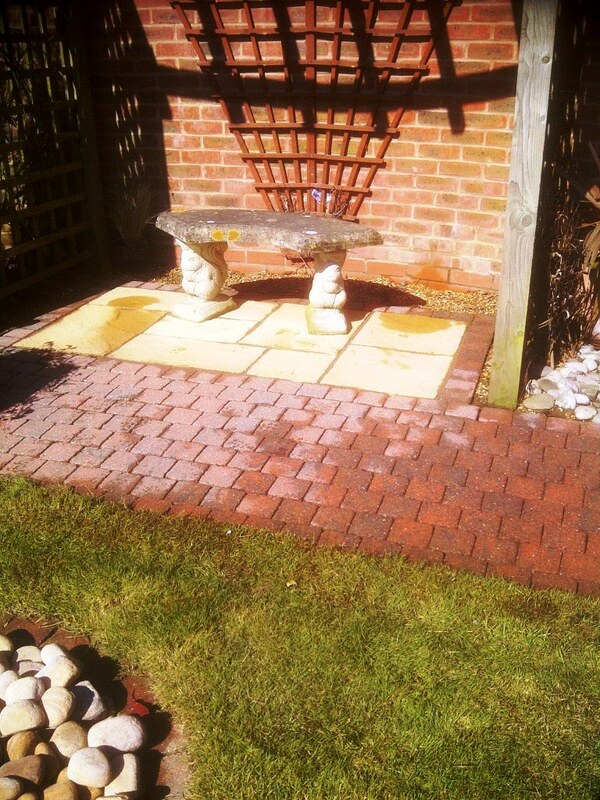 You may be surprised but we just clean interior stone and tile we also specialise in exterior stone cleaning as well as you will see with the post below where we cleaned and re-pointed a neglected patio at a house in Rushden. 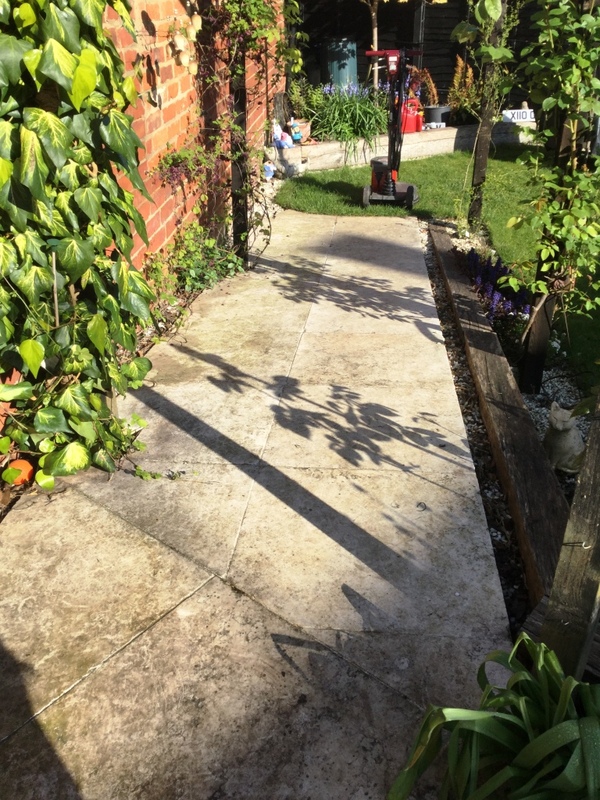 The first photo shows the condition of the patio which hadn’t been professionally cleaned for over forty years, weeds and moss had eaten through all the original mortar and made any remaining cement very lose and would need to be replaced after pressure washing. 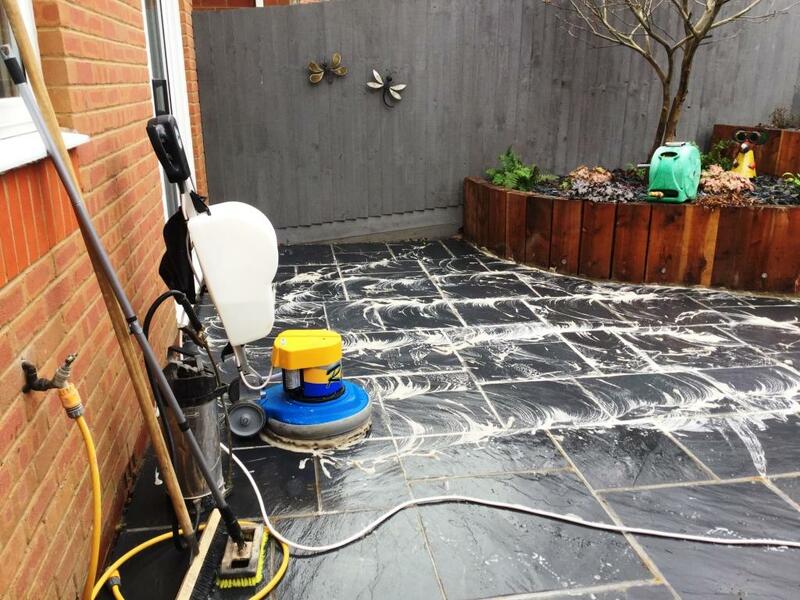 The second picture shows the equipment set up ready to pressure wash the patio, the power of the pressure washer blasted away most of the dirt and we used Tile Doctor Remove and Go on any stubborn stains that became evident. 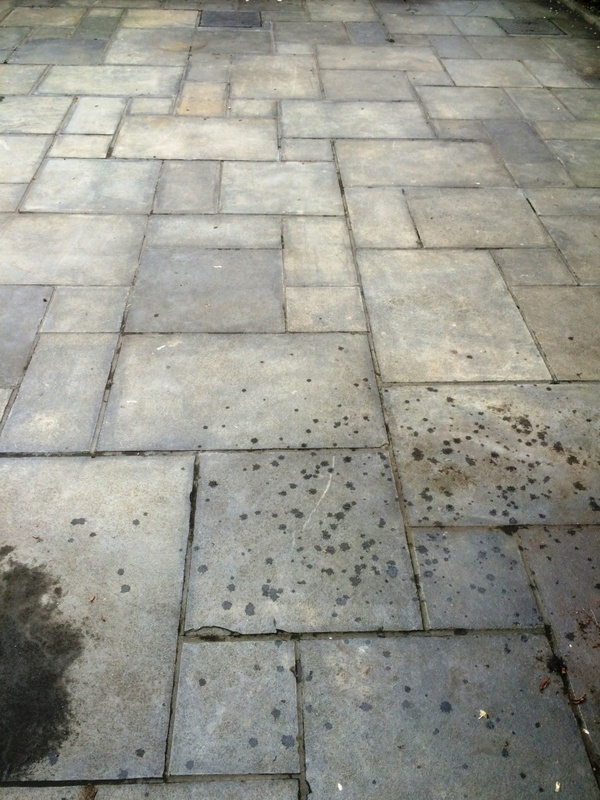 The third picture below shows the results after the patio has been pressure washed; you can see that the remaining mortar had all but washed away. After allowing a few days for the patio to completely dry out I returned to site to repoint all joints between the slabs. There are a few different colours to choose from and on this occasion the customer chose a light grey. 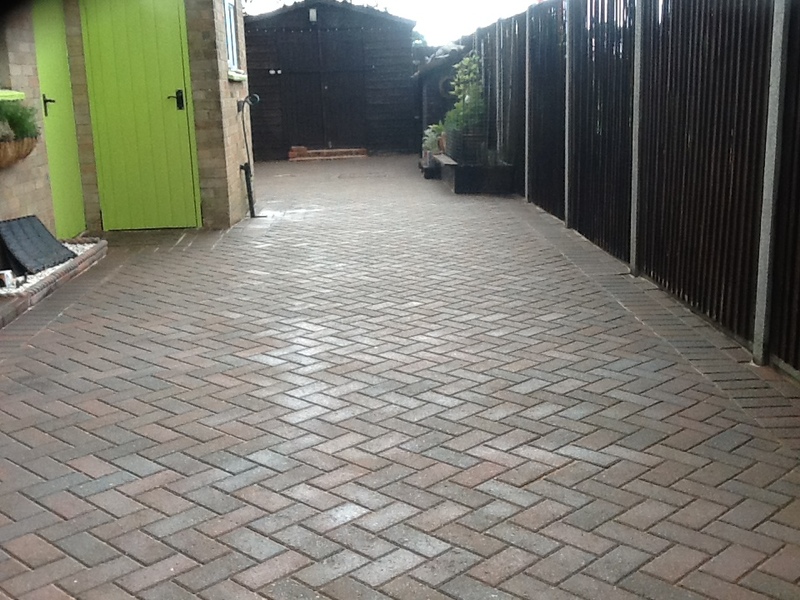 The final picture shows the finished patio after it had been sealed. 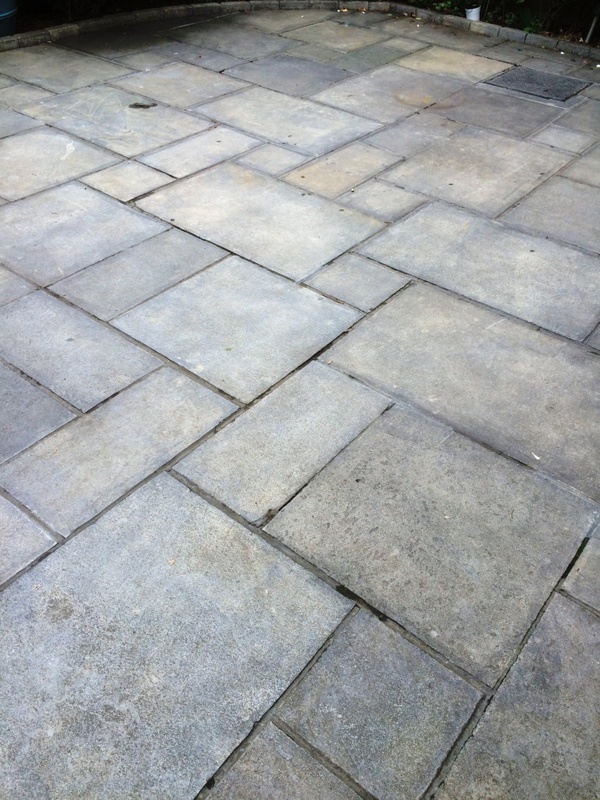 The customer was over the moon with the results as she had no idea that the slabs were different colours under the 40 years of dirt, grime and weeds.